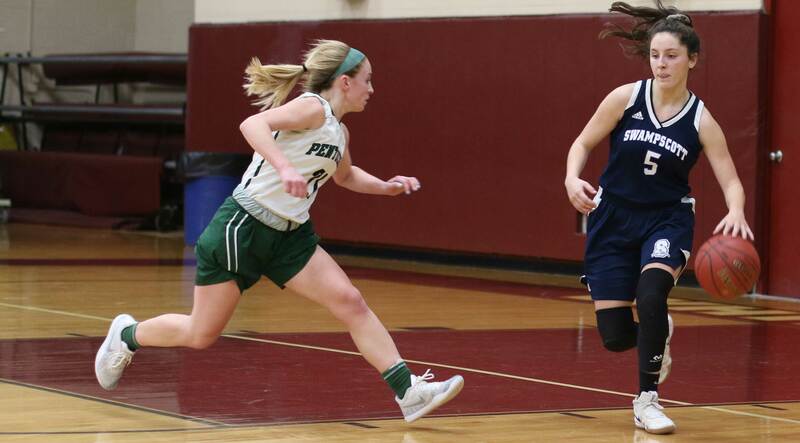 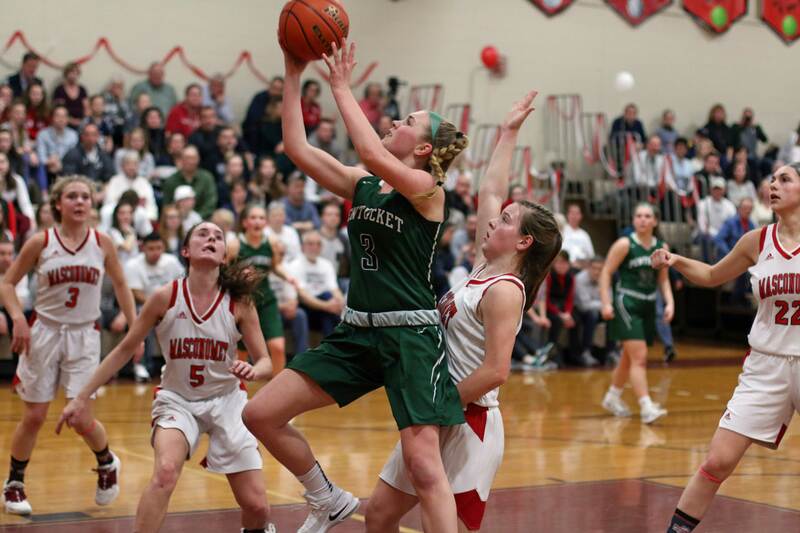 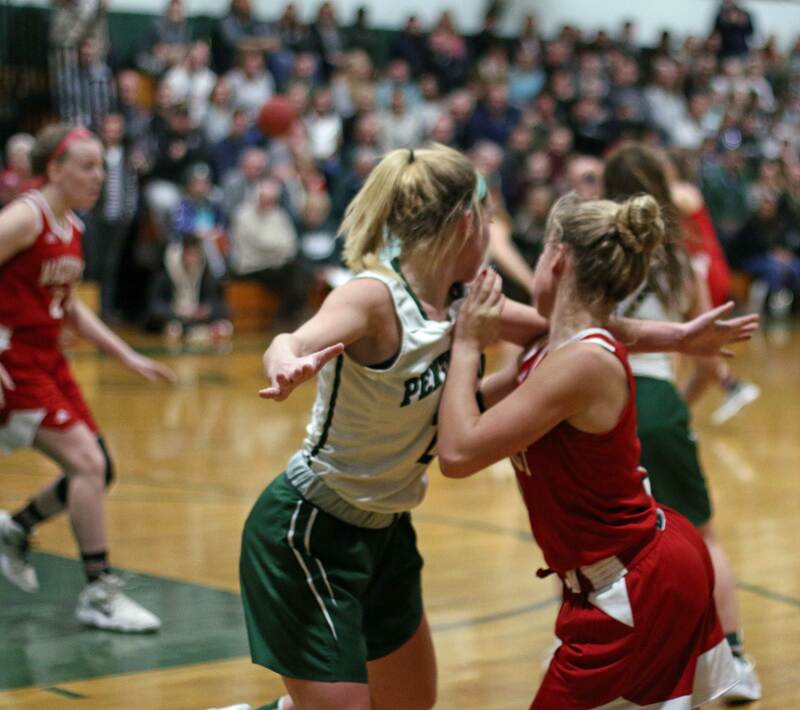 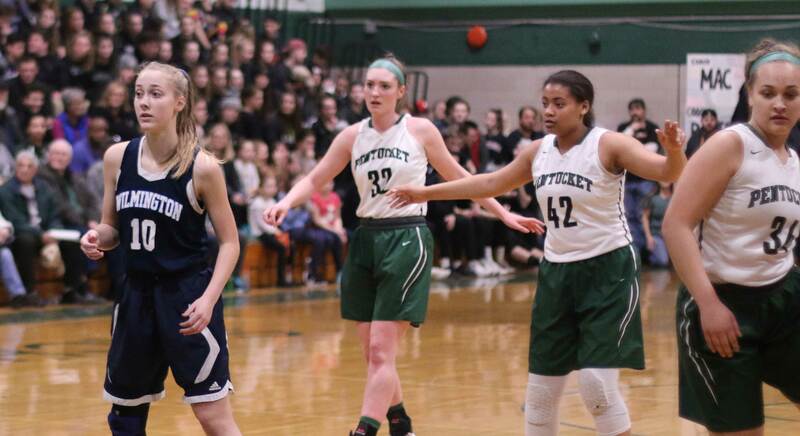 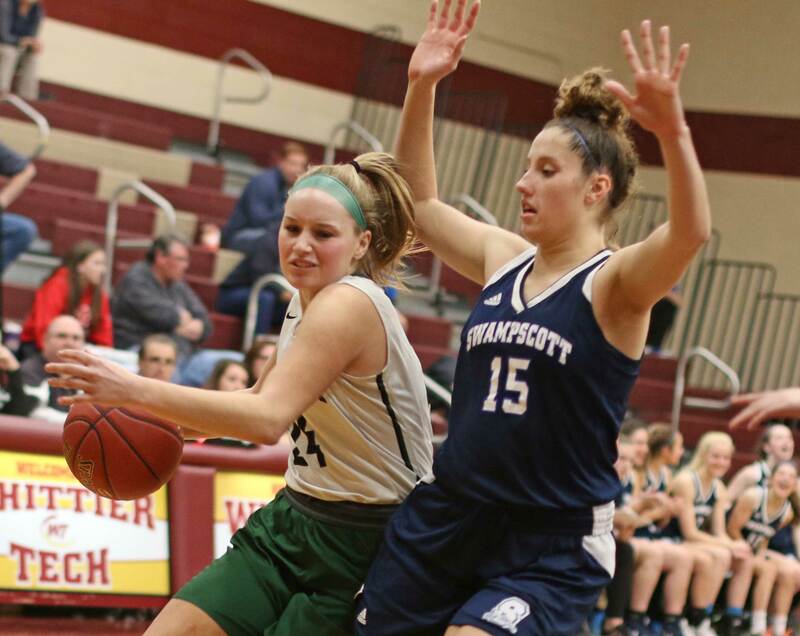 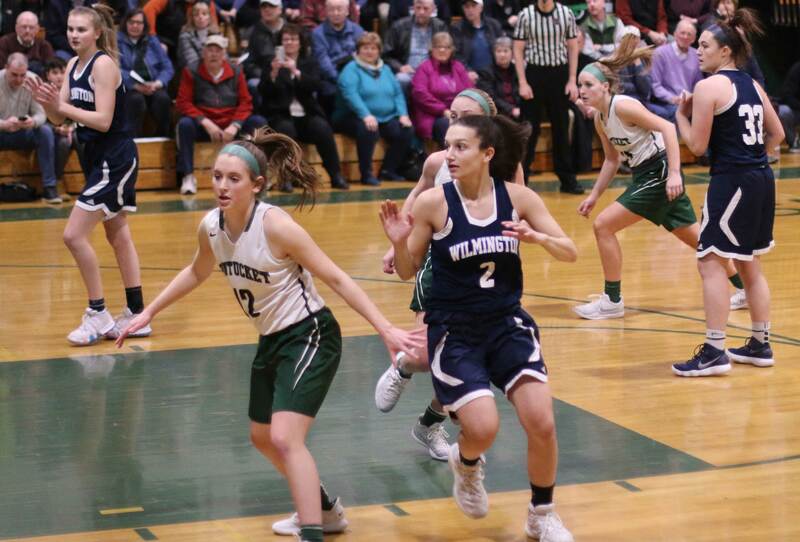 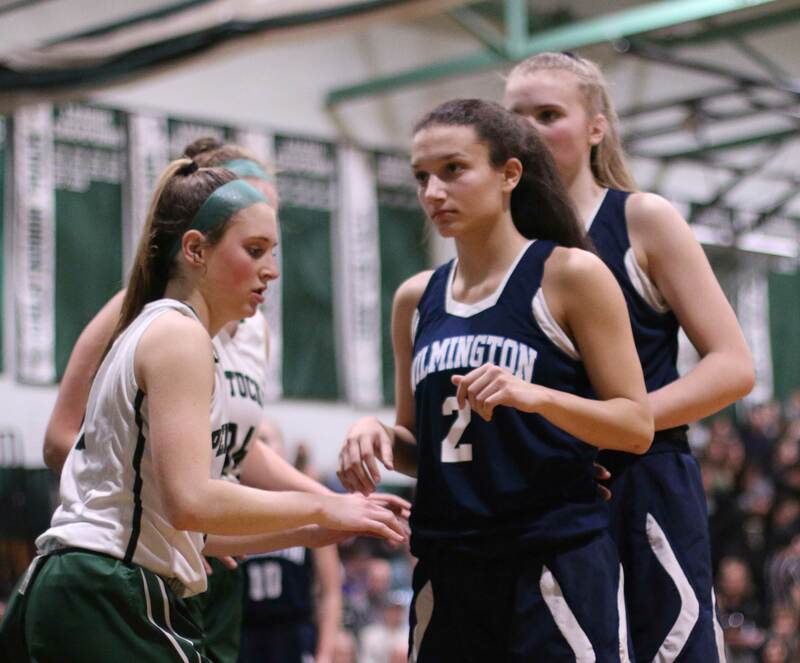 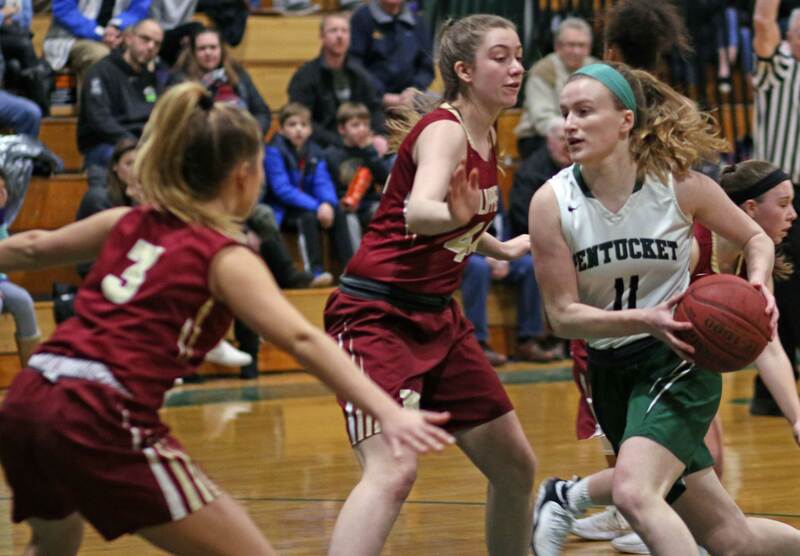 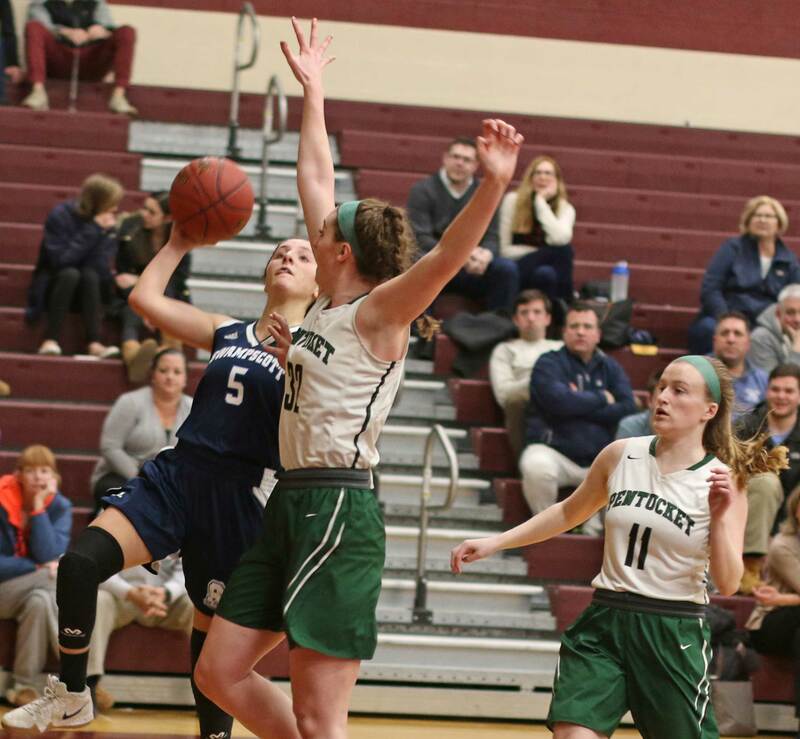 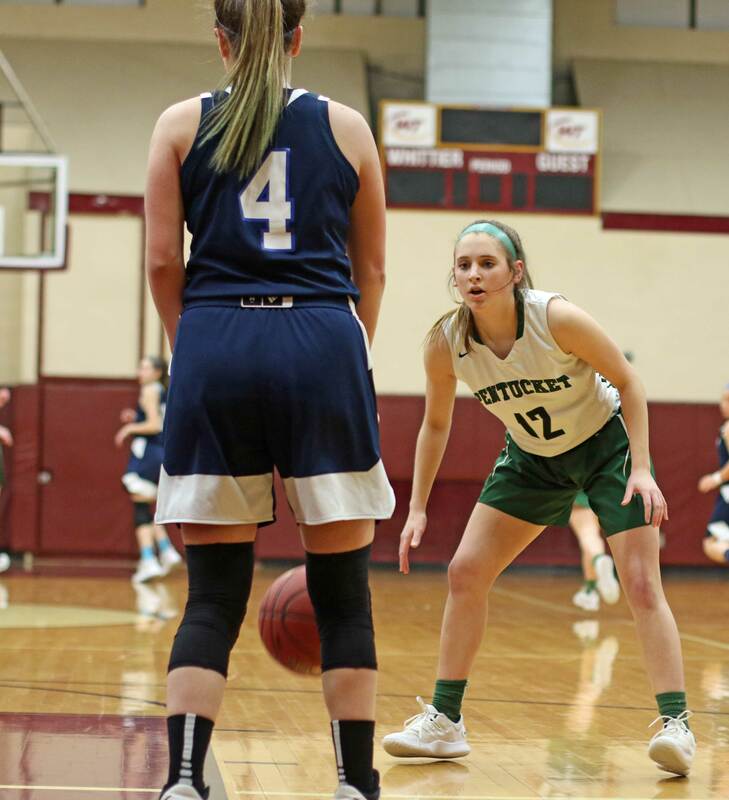 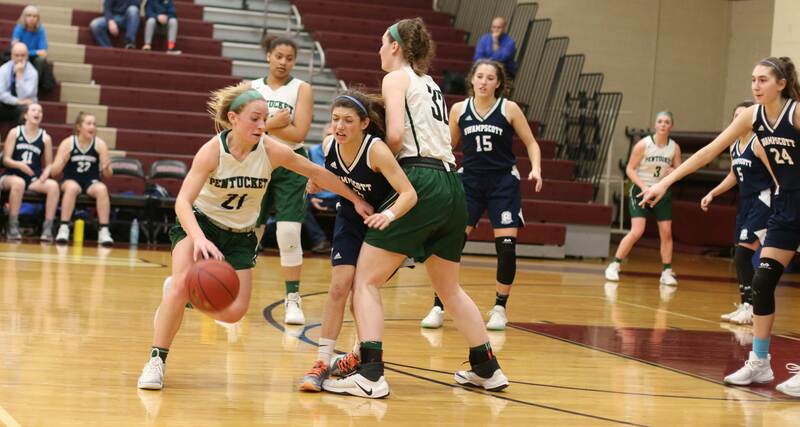 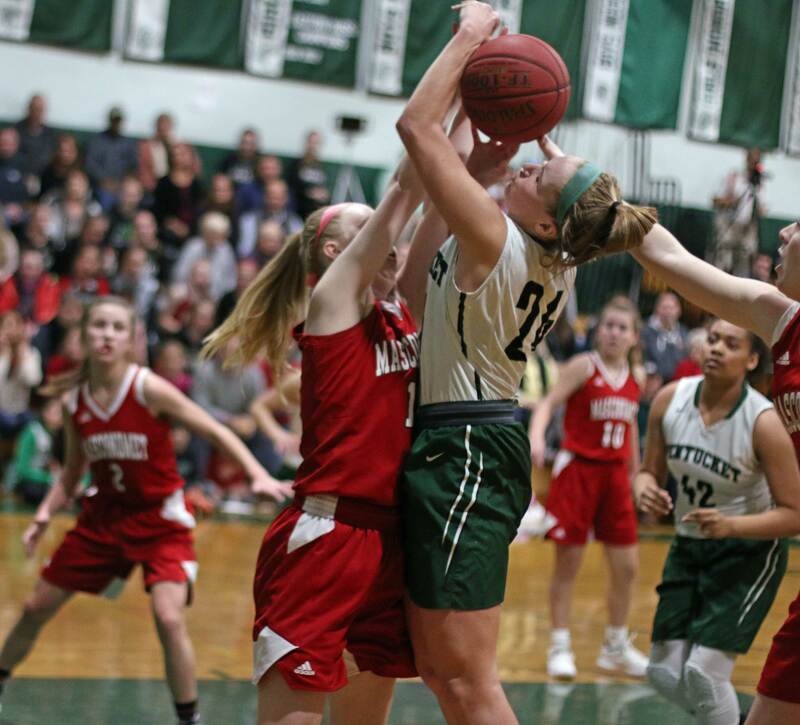 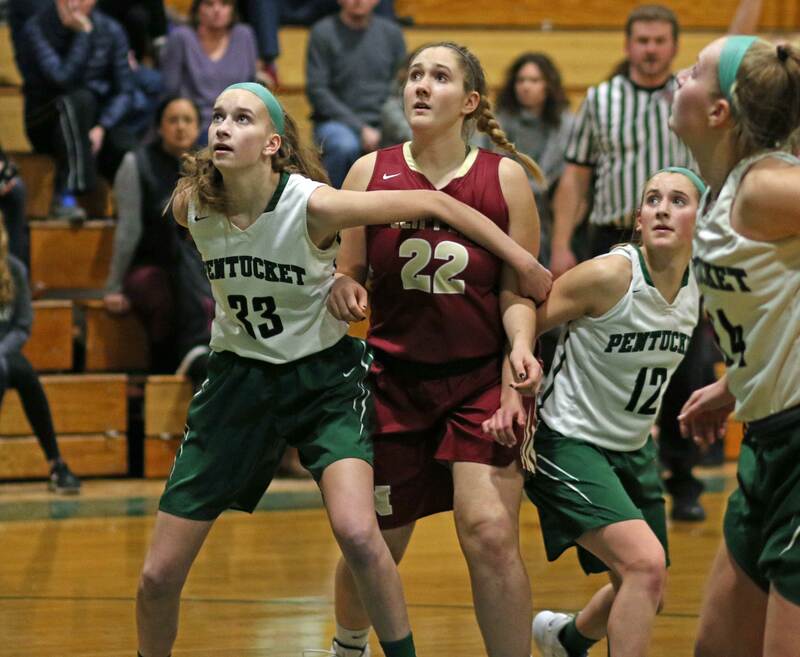 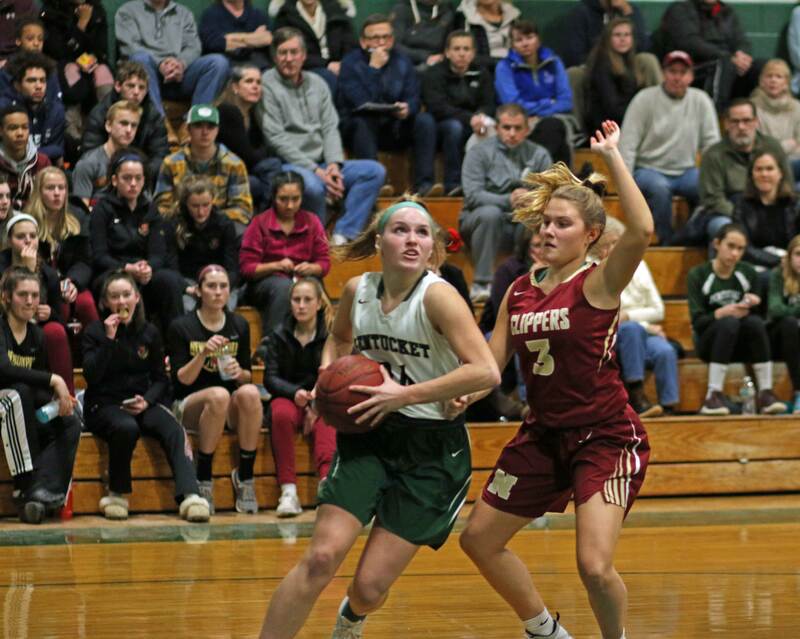 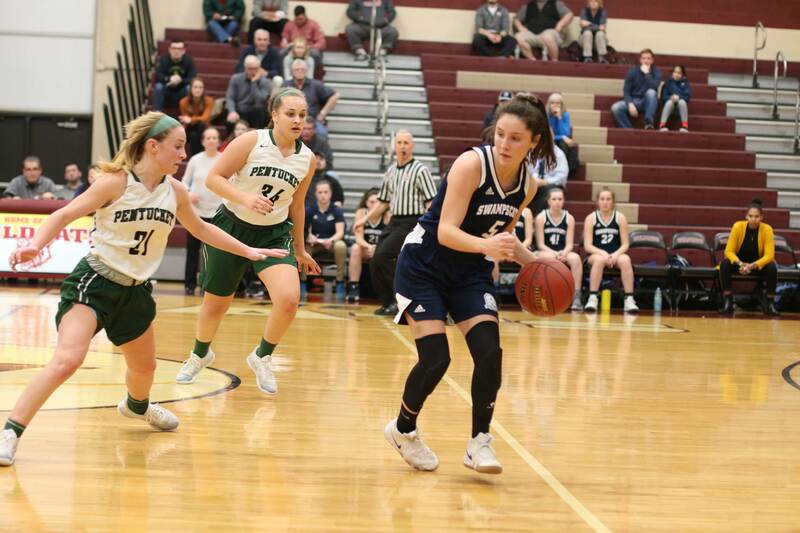 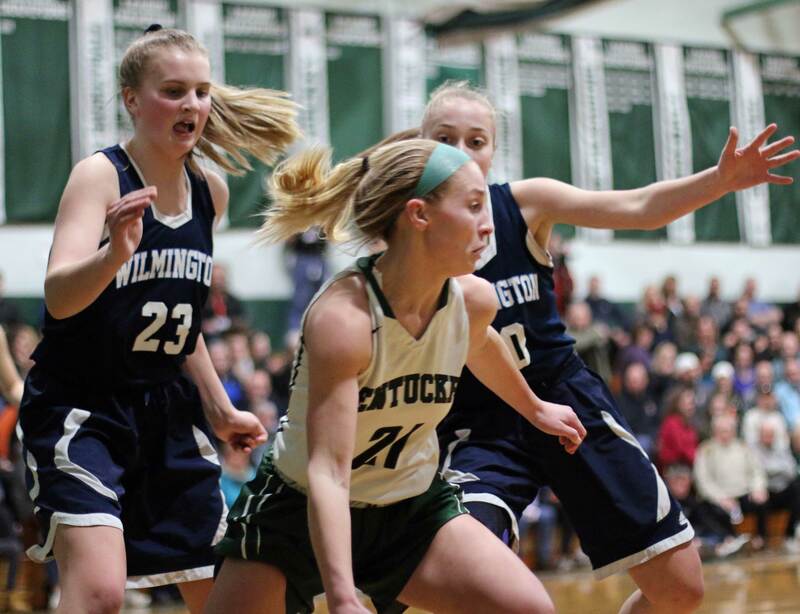 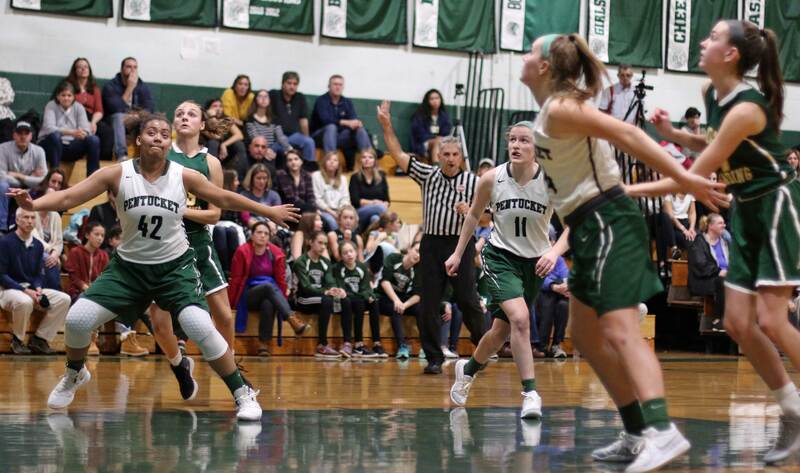 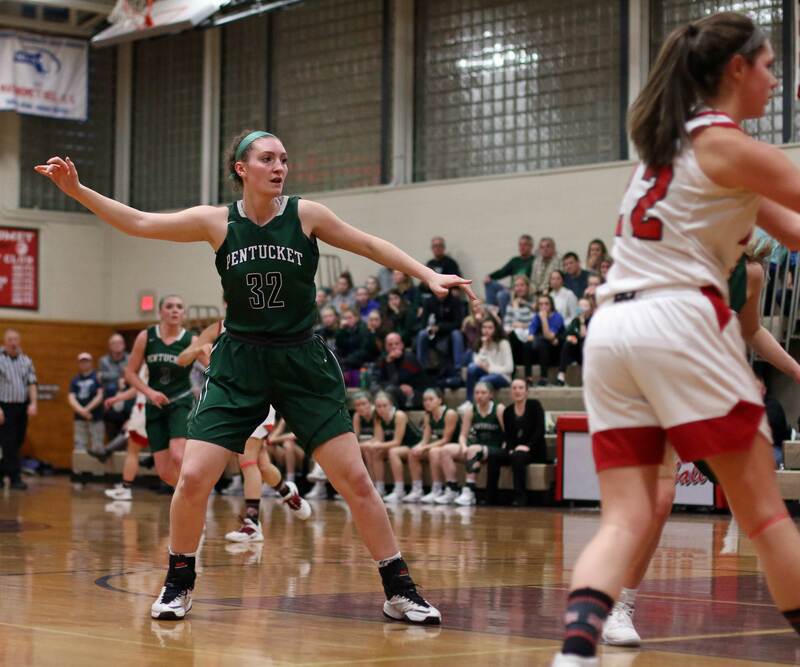 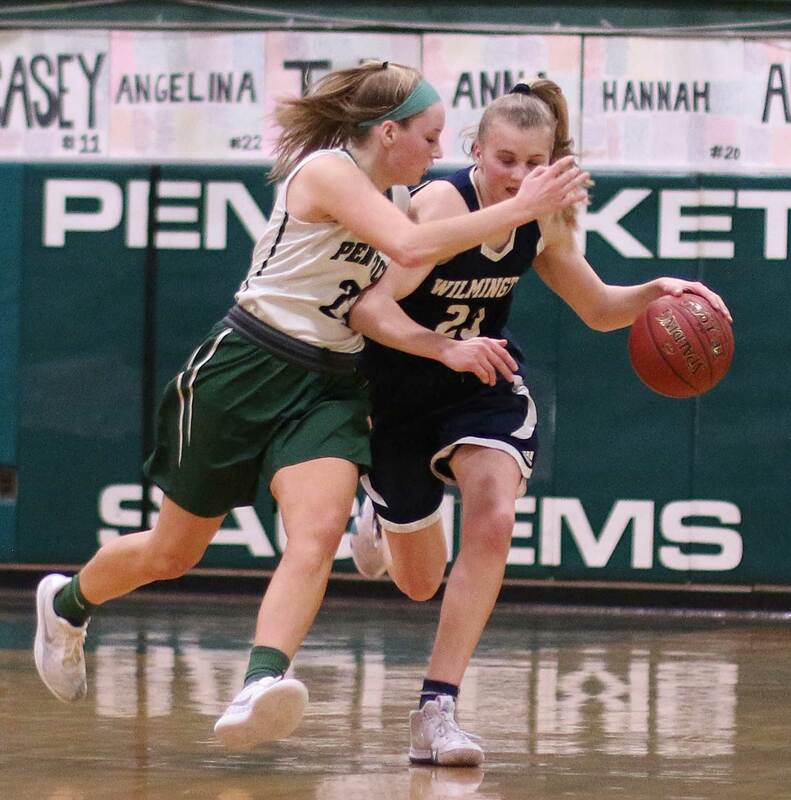 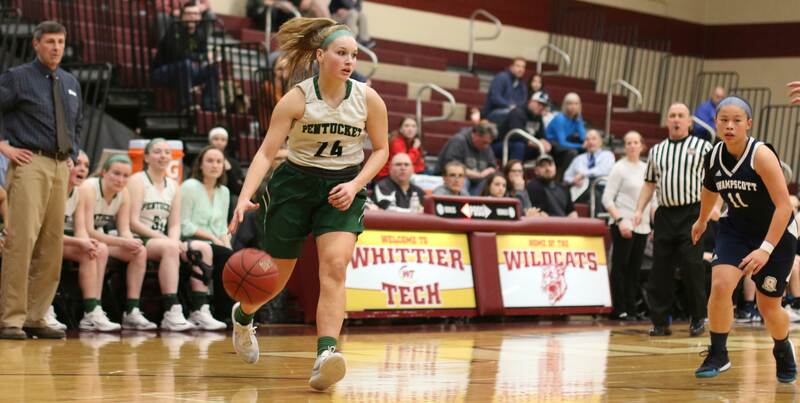 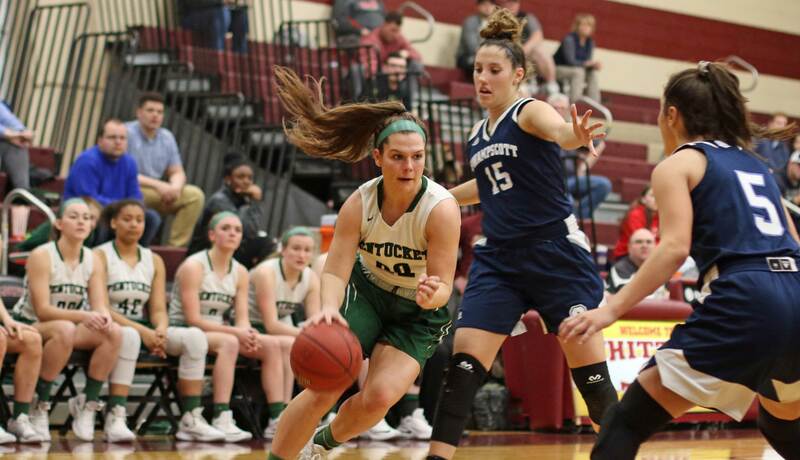 (Haverhill MA) Fouls were a problem for Pentucket in the first half but that didn’t prevent the Sachems from defeating Swampscott, 52-28, on Tuesday night at Whittier. 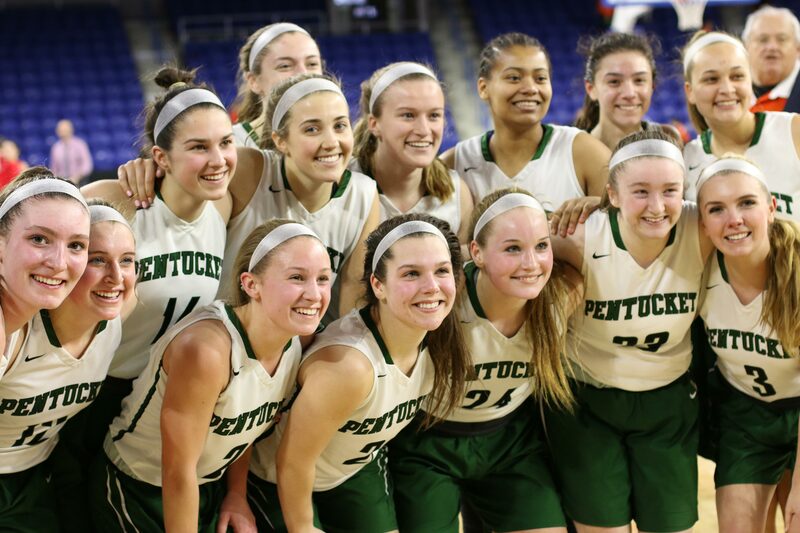 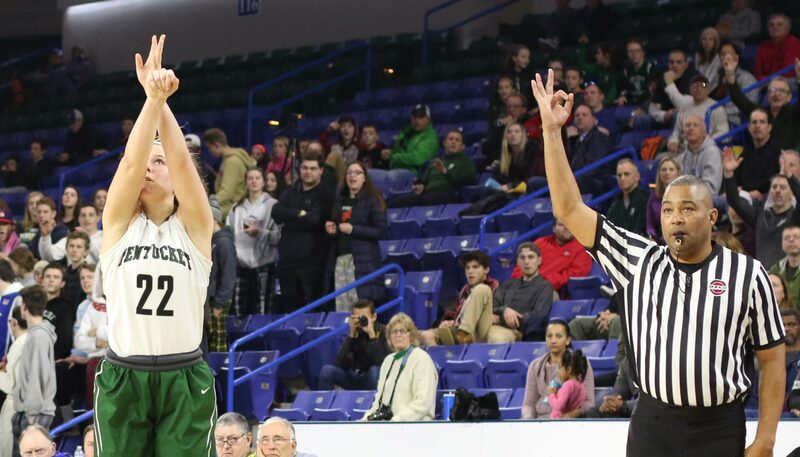 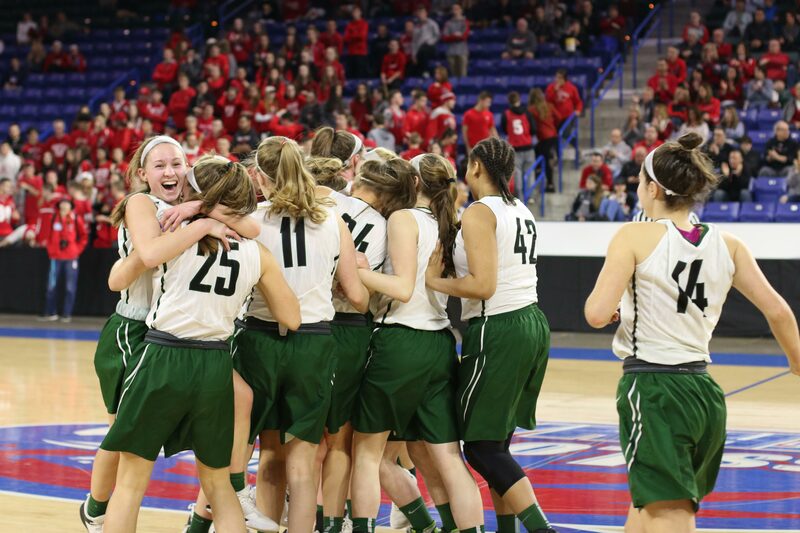 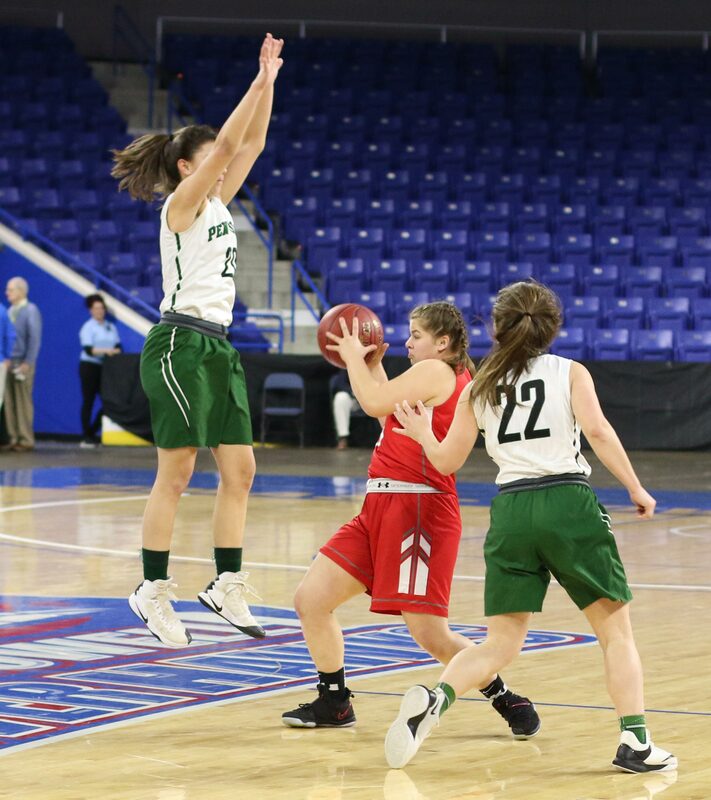 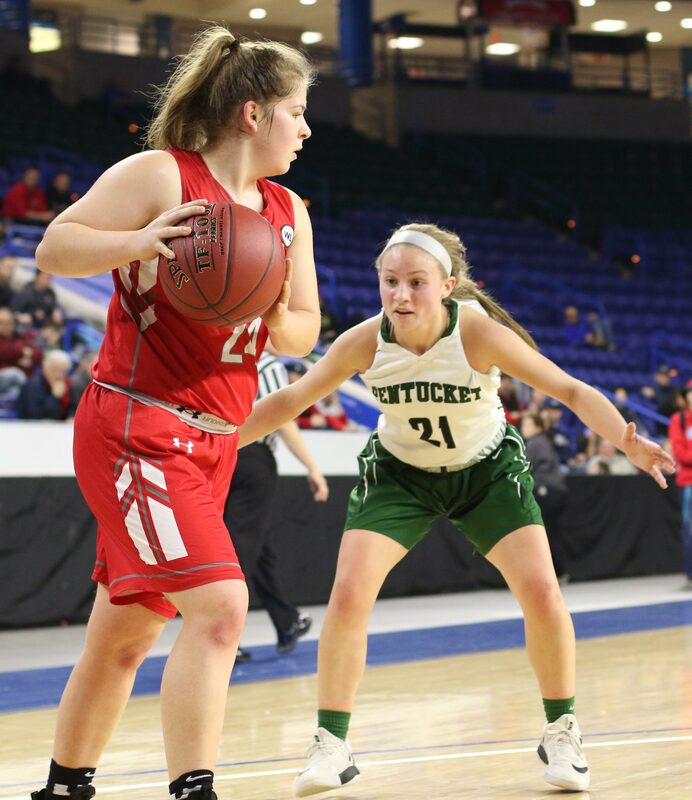 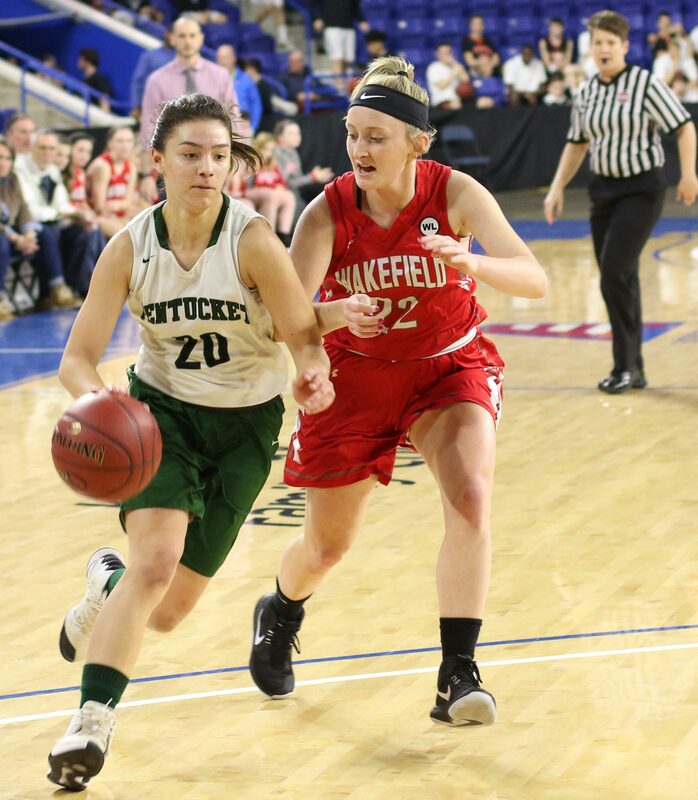 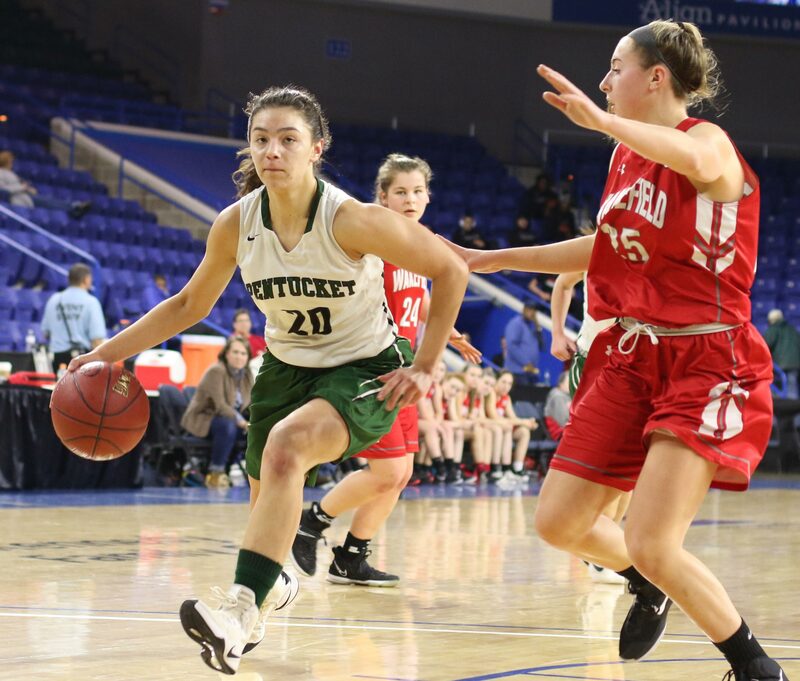 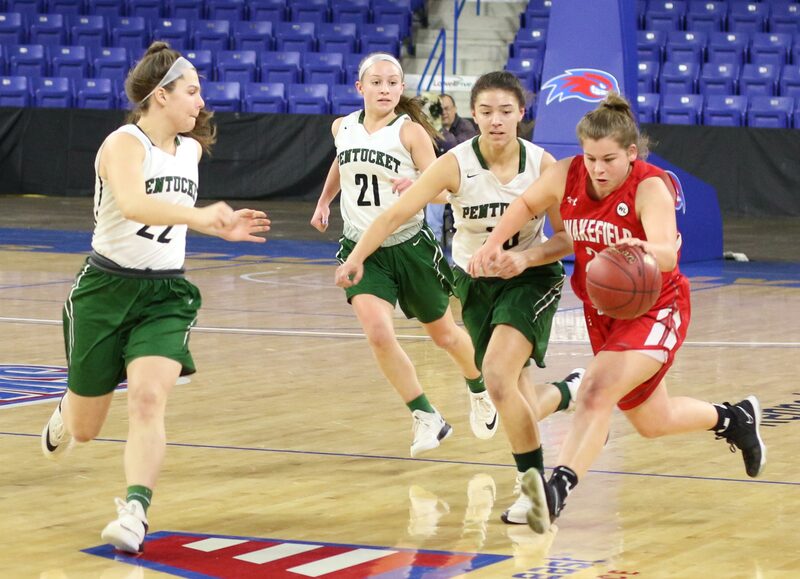 The win sends Pentucket (21-3) to the Division 2 North finals at the Tsongas Arena on Saturday to face the winner of the Tewksbury/Melrose game. 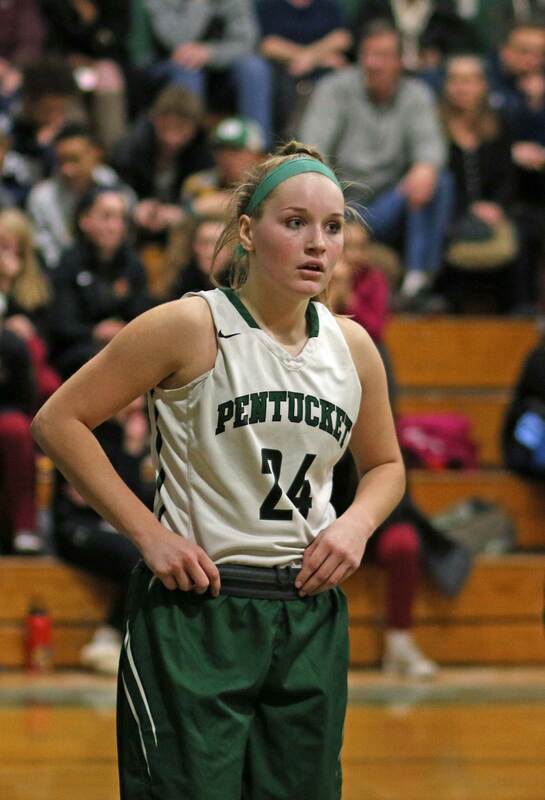 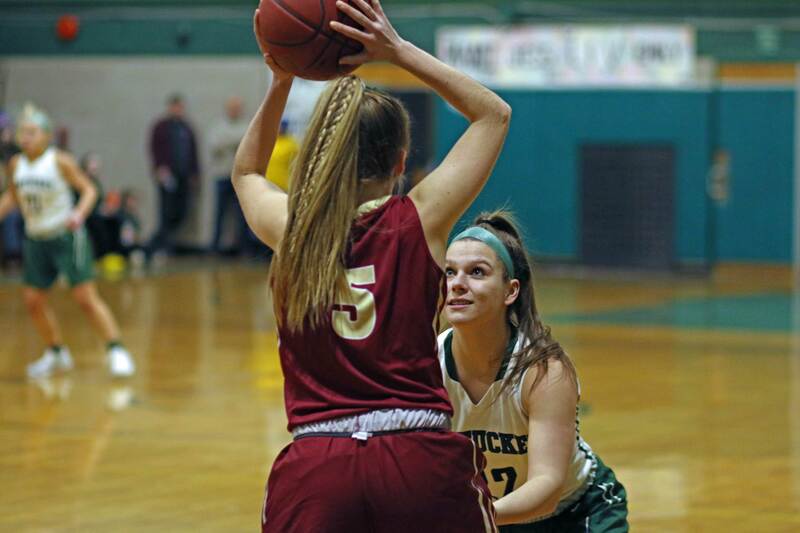 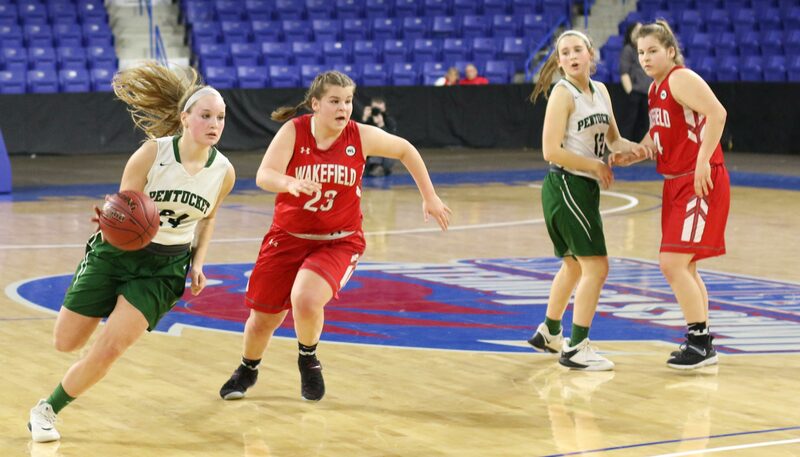 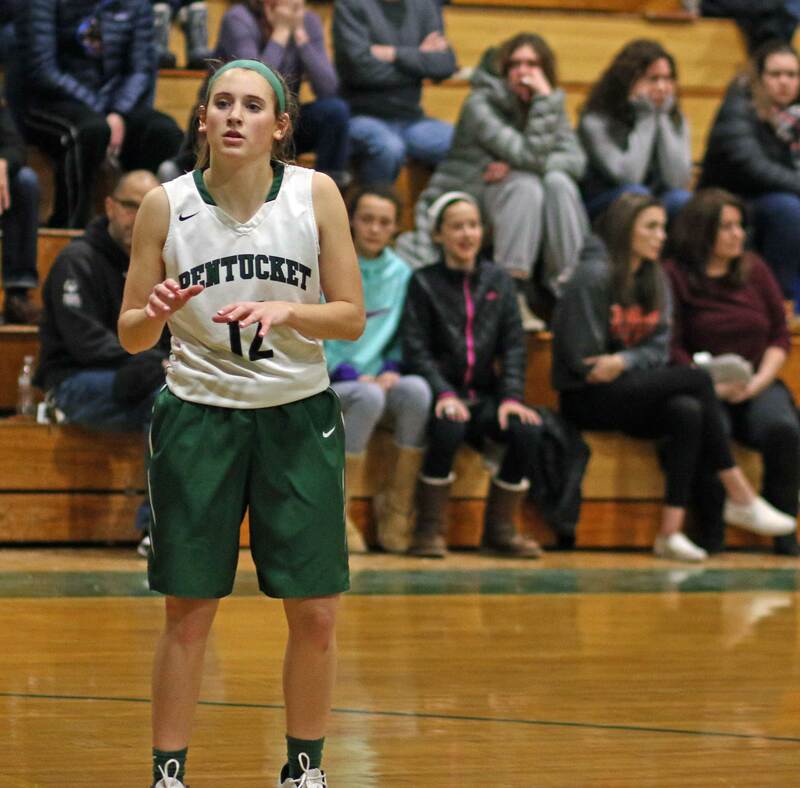 For part of the second quarter, Maddie Doyle was the only Pentucket starter on the floor. 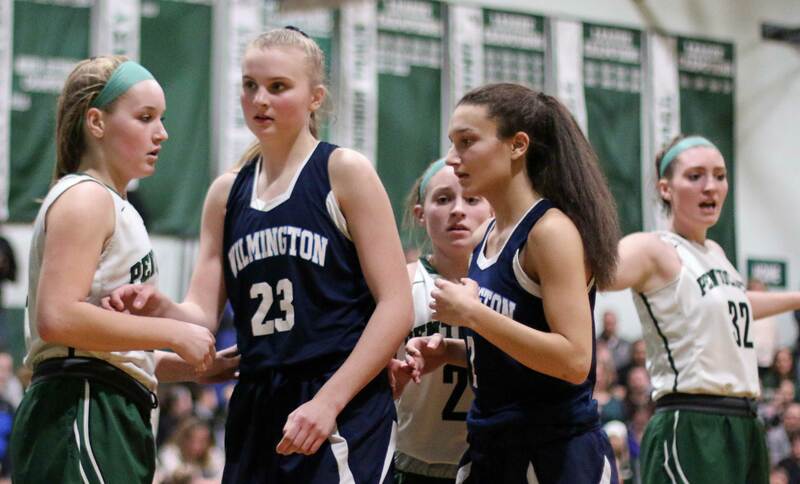 Angelica Hurley, Angelina Yacubacci, and Jess Galvin each had two fouls while Liv Cross had an injury. 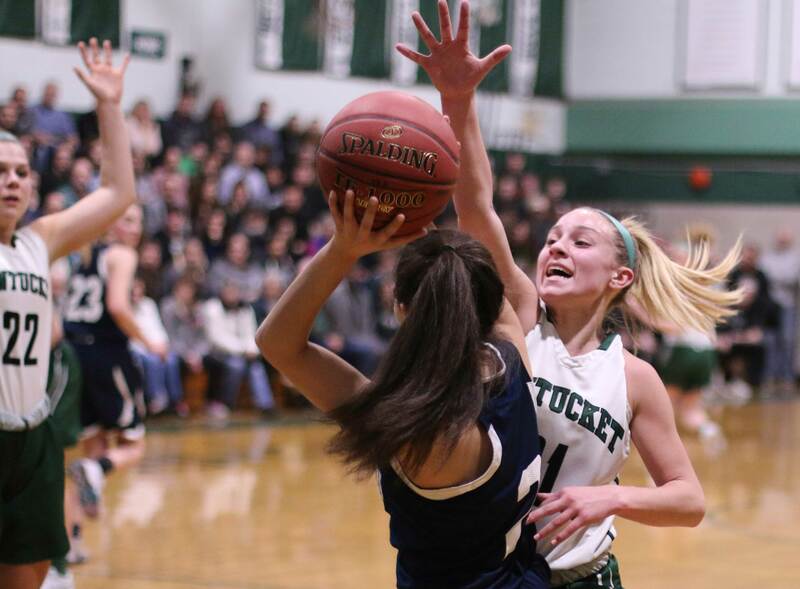 Instead of Swampscott taking advantage of Pentucket’s foul woes, they instead fell behind, 15-5, after one quarter. 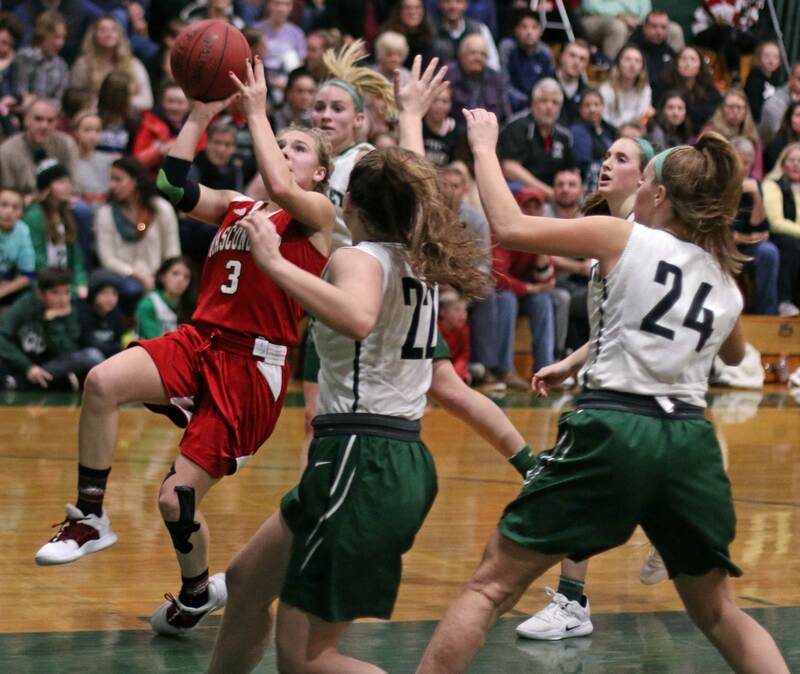 The personnel for the Sachems may have changed but the effective defense didn’t. 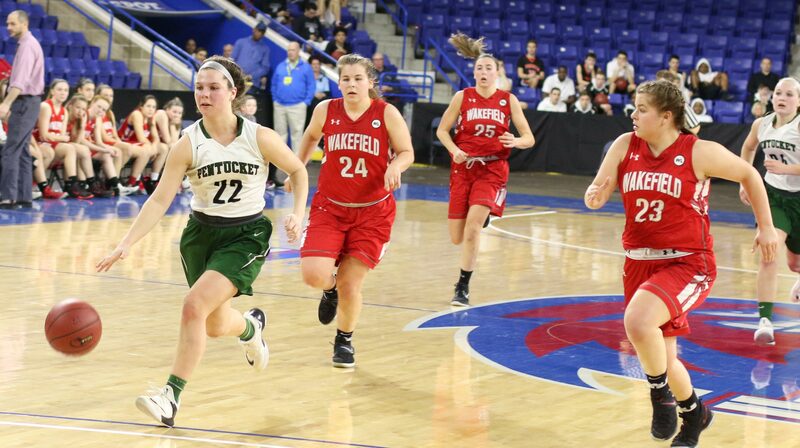 Their full-court pressure often forced turnovers and hurried shots. 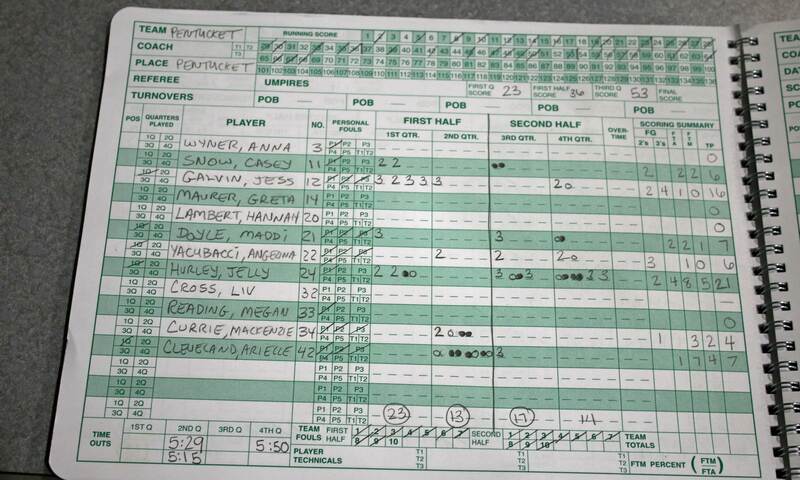 The Big Blue (16-6) were only down 26-16 at the half. 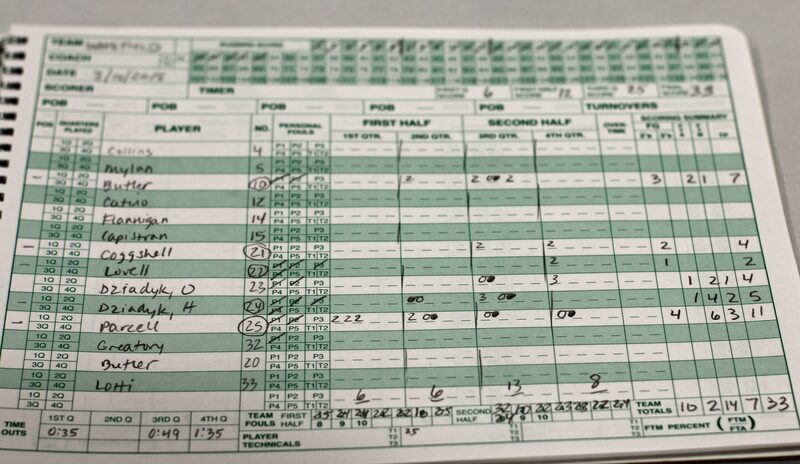 Make some shots and things could get interesting. 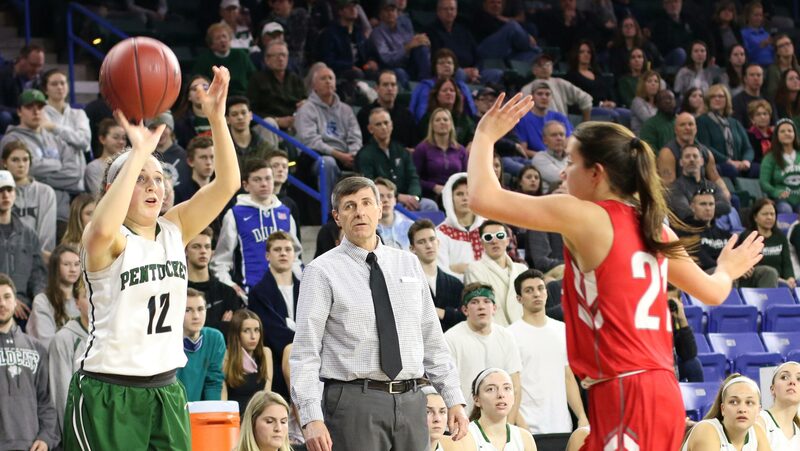 “I told the team at halftime,” said Coach McNamara, “that they had to settle down and play better defense.” And that is what they did. 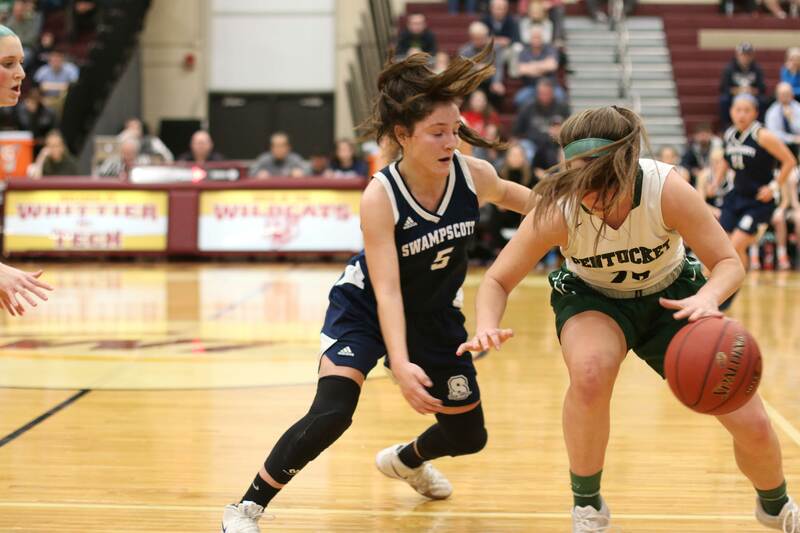 The starters applied their tight brand of defense with few fouls, while down the other end the points started to pile up. 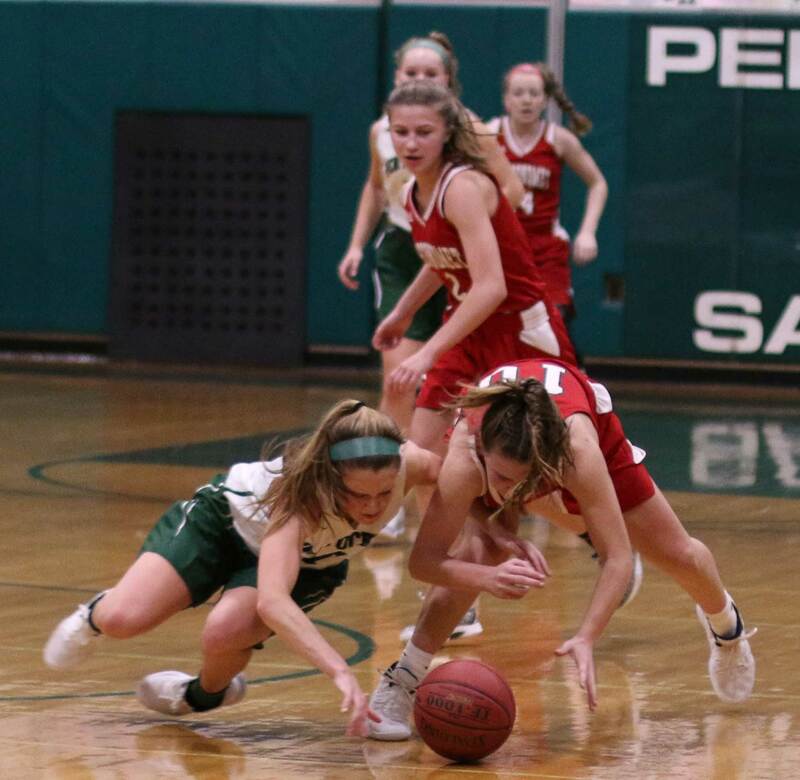 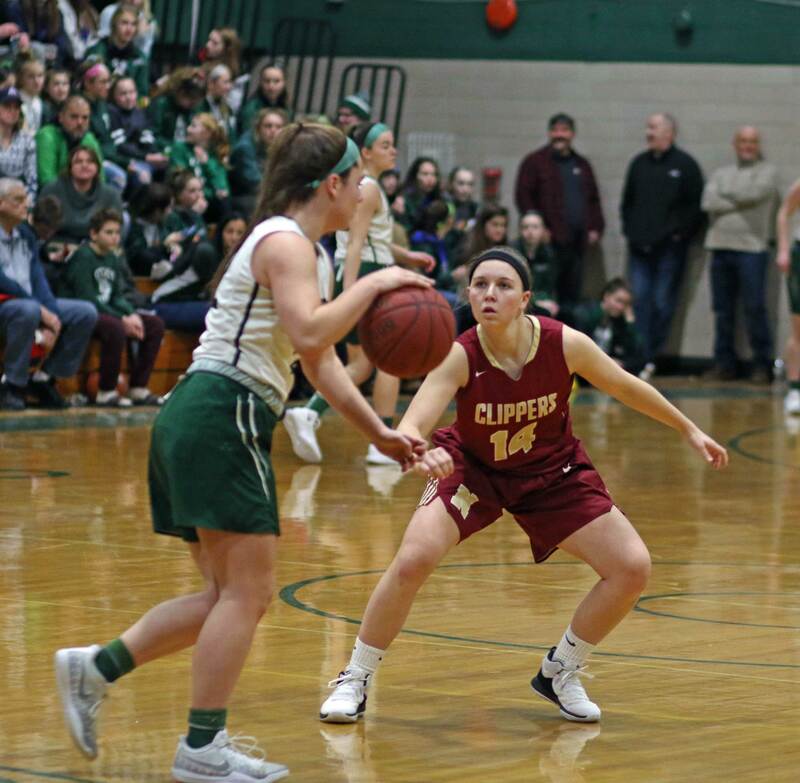 Angelina Yacubacci (15 points) had a triple and two free throws while teammate Maddi Doyle added a layup and a triple to pace the Sachems in the breakaway third quarter. 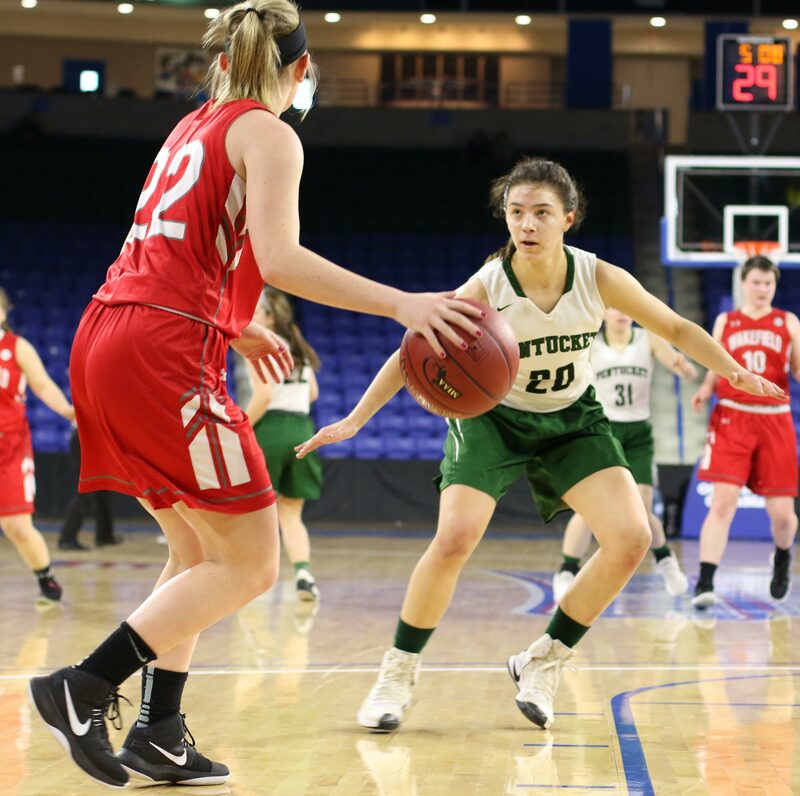 That 10-point halftime lead bulged to 39-22 and the #1 seed coasted through the final quarter. 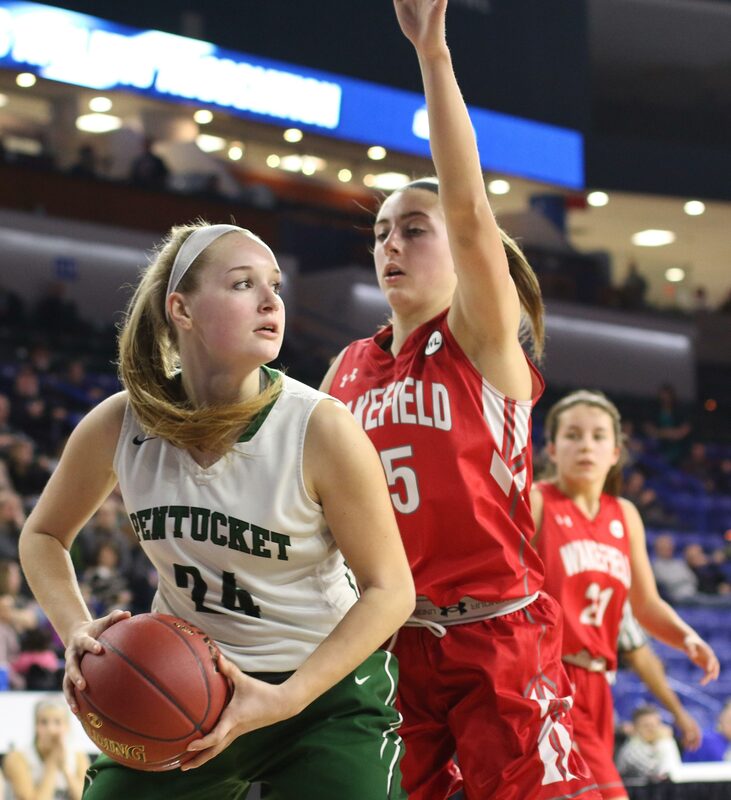 Maddi Doyle told me after the game that she wants to go to the College of Charleston in South Carolina in the fall and study physical therapy. 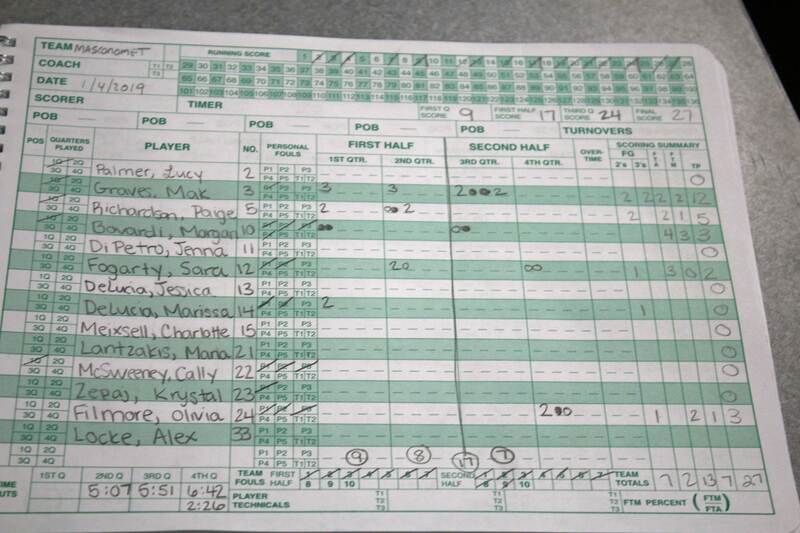 Senior Grace DiGrande paced SHS with eleven points. 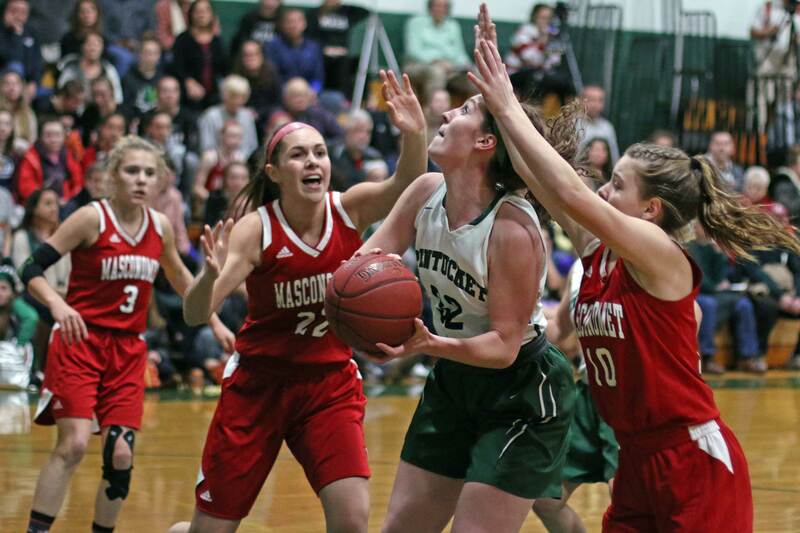 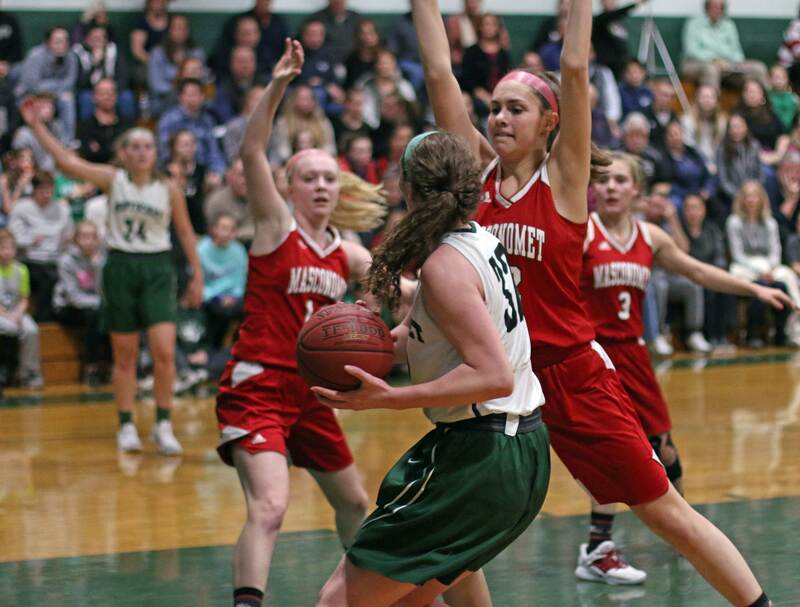 Sophomore MacKenzie Currie had ten points for Pentucket. 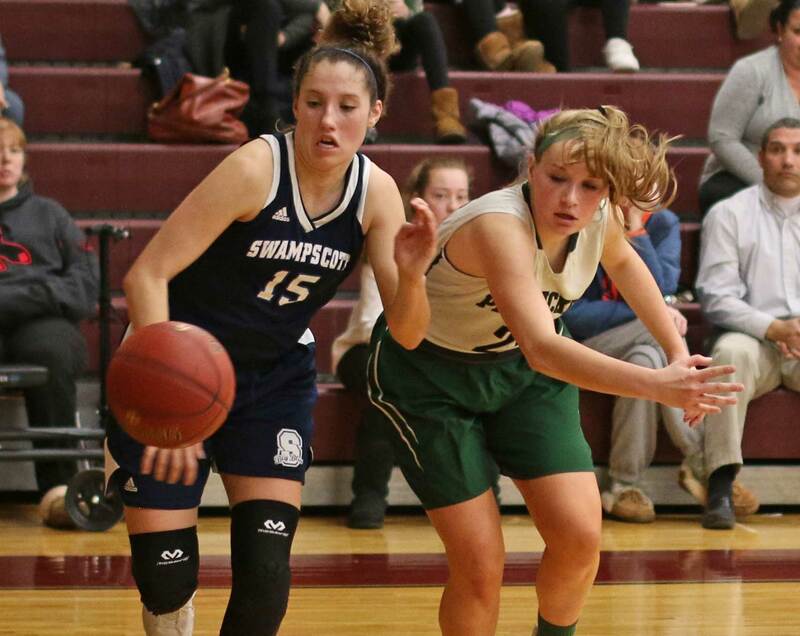 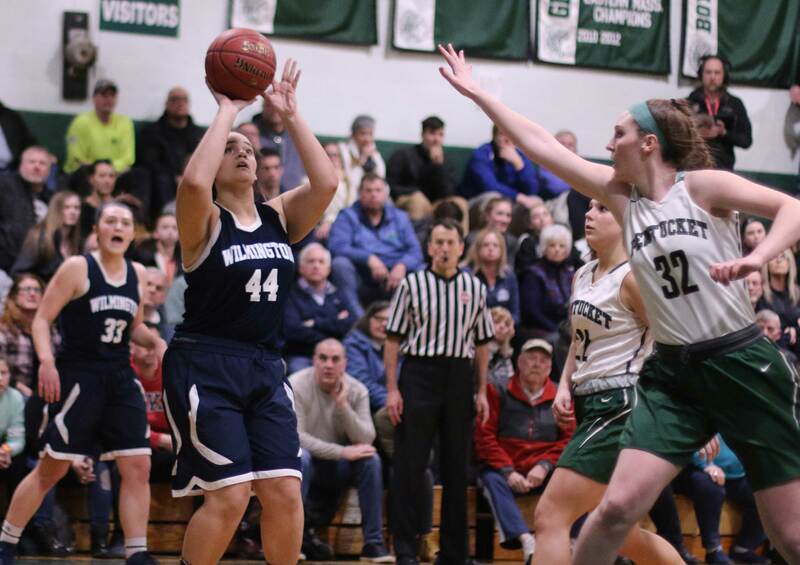 Swampscott’s Nikki Rosa is going to play basketball for Roger Williams next year. 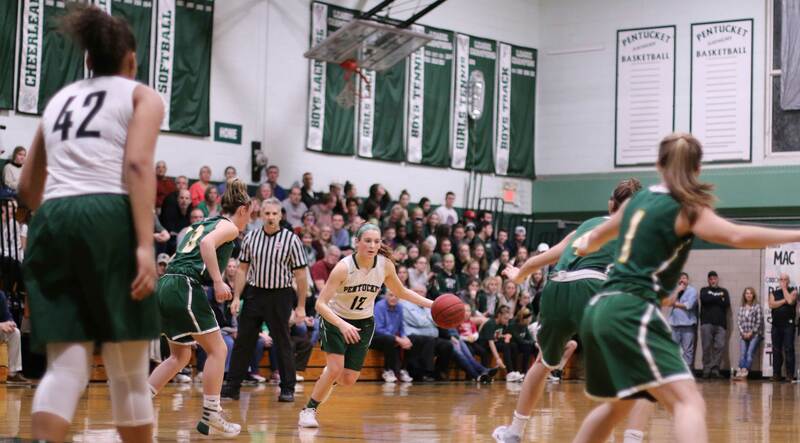 Katie Watts is going to go to Endicott to play softball. 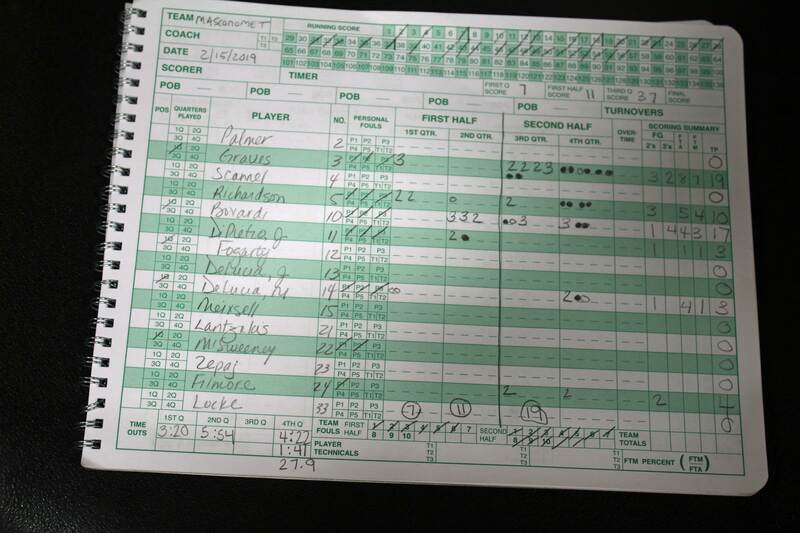 The Big Blue reached the semifinals by defeating North Reading 49-47. 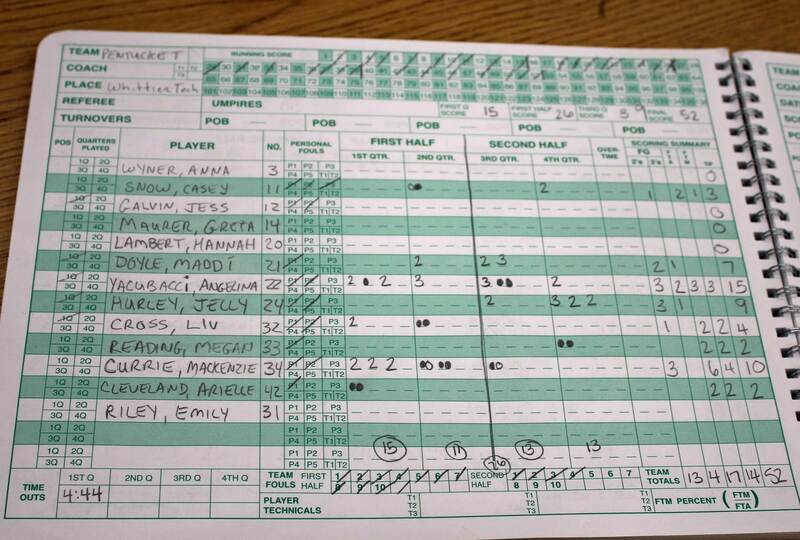 Nikki had nineteen points and twelve rebounds against the Hornets. 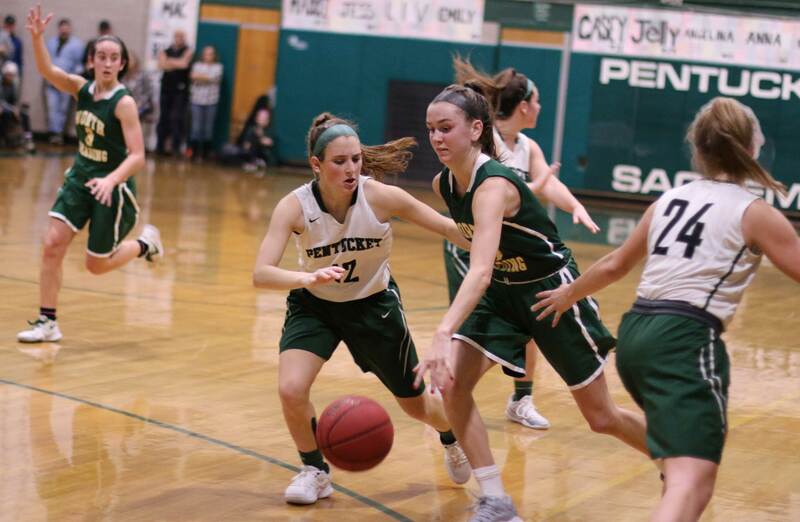 (West Newbury MA) The names change but the approach to defense doesn’t. 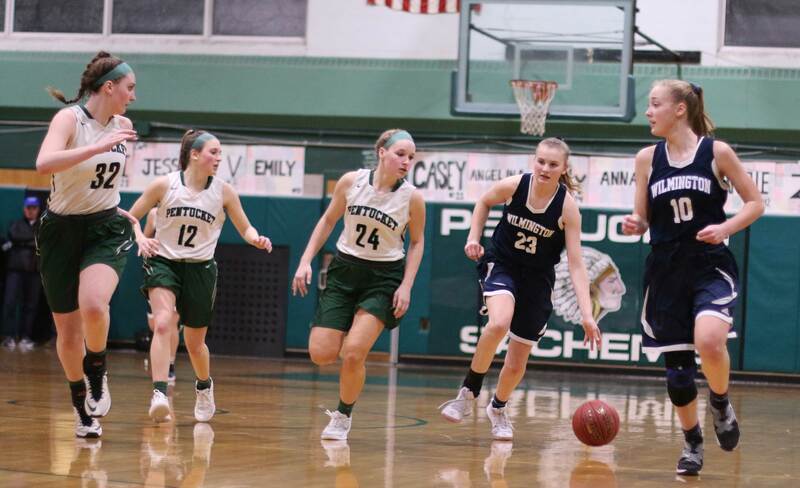 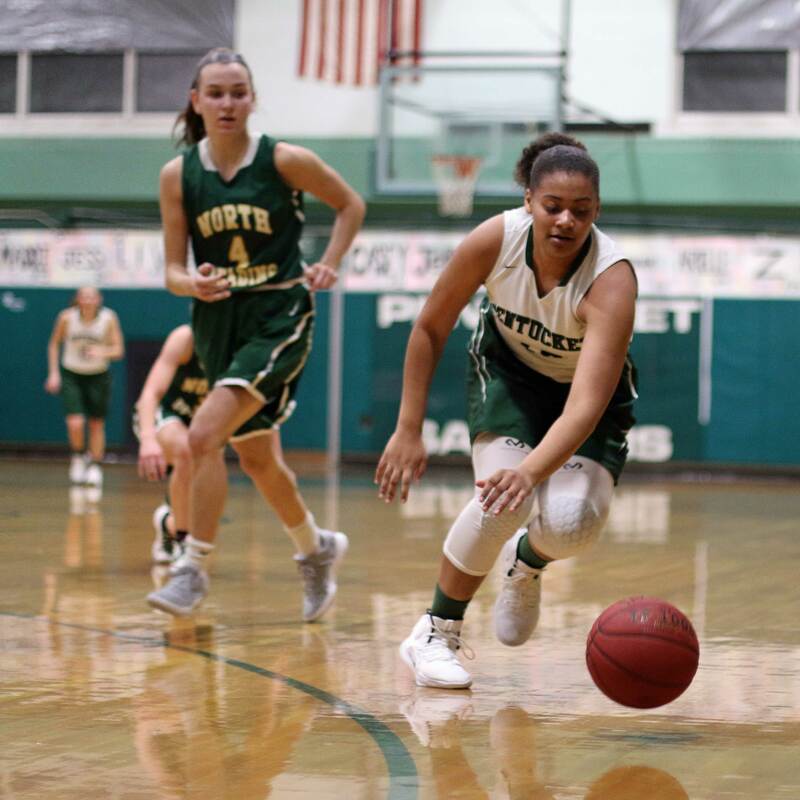 Pentucket (3-0) held North Reading (2-1) to just two points in the first quarter and went from there to a 57-33 win on Friday night. 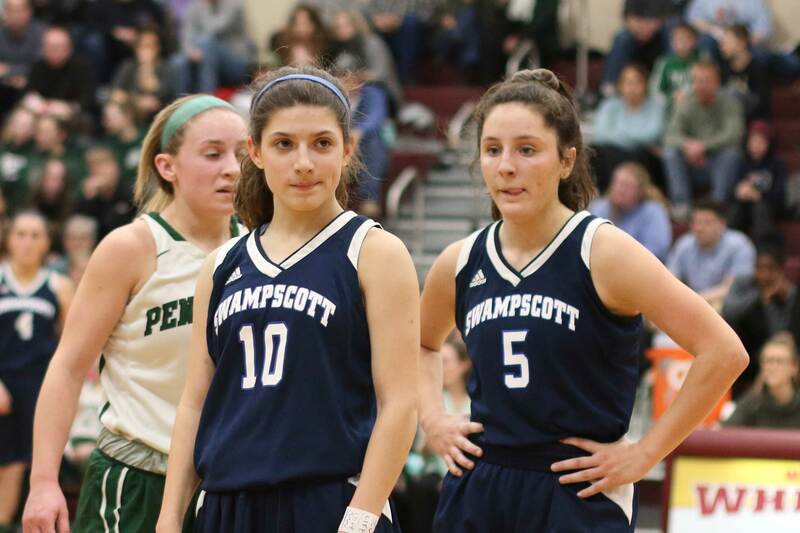 Both teams had started the season with two wins over Cape Ann League competition. 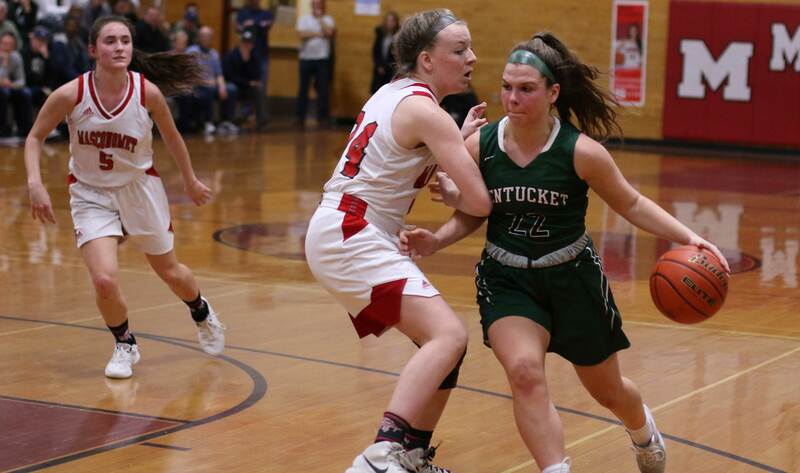 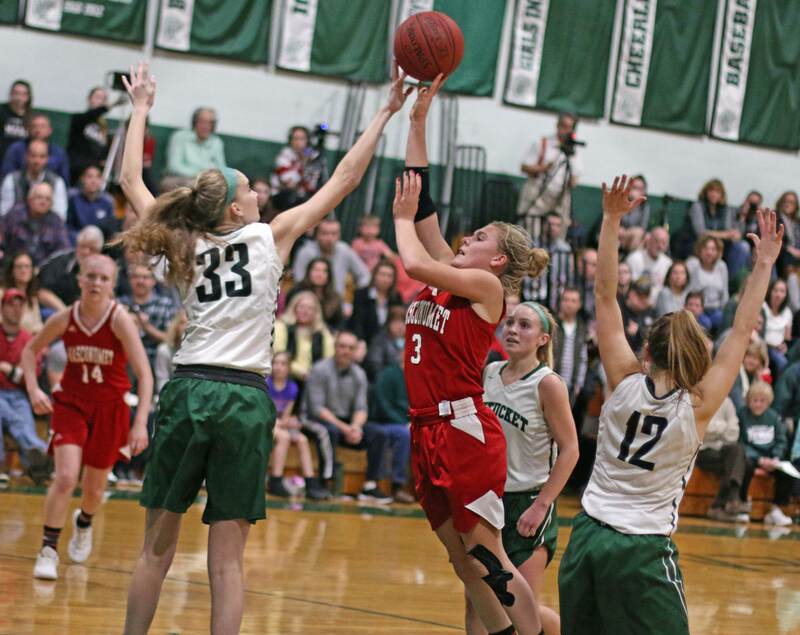 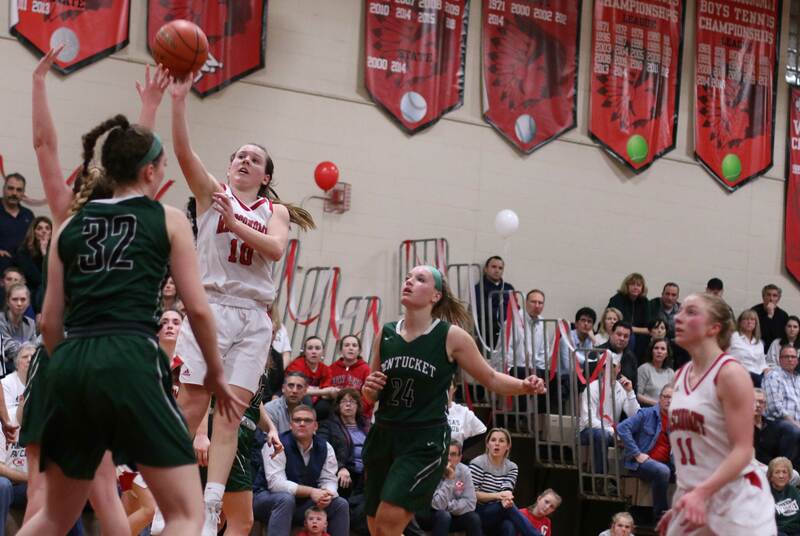 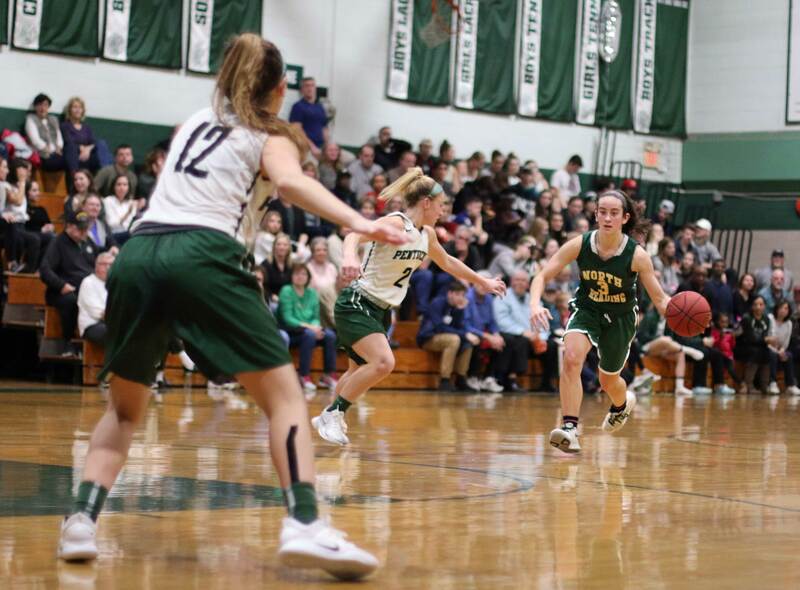 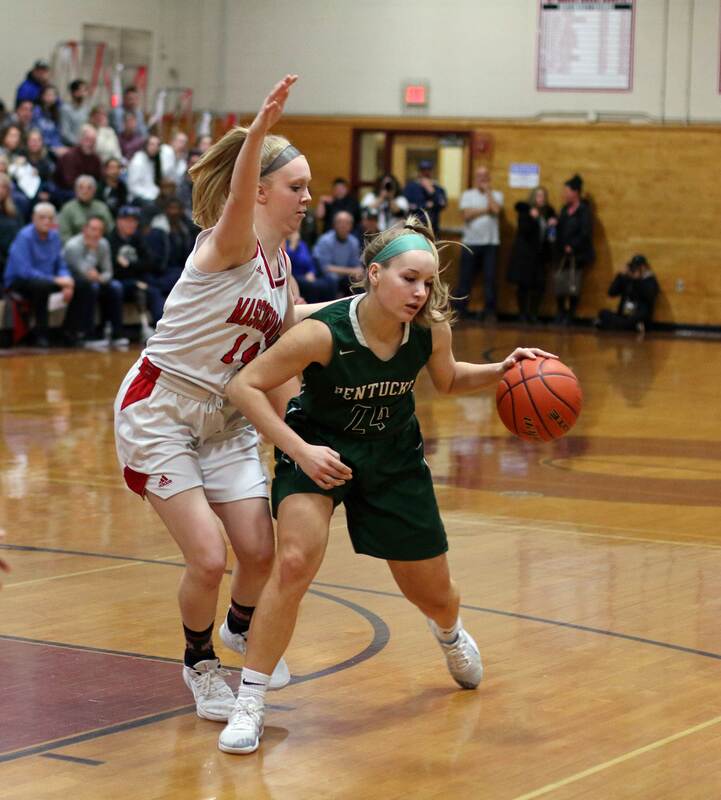 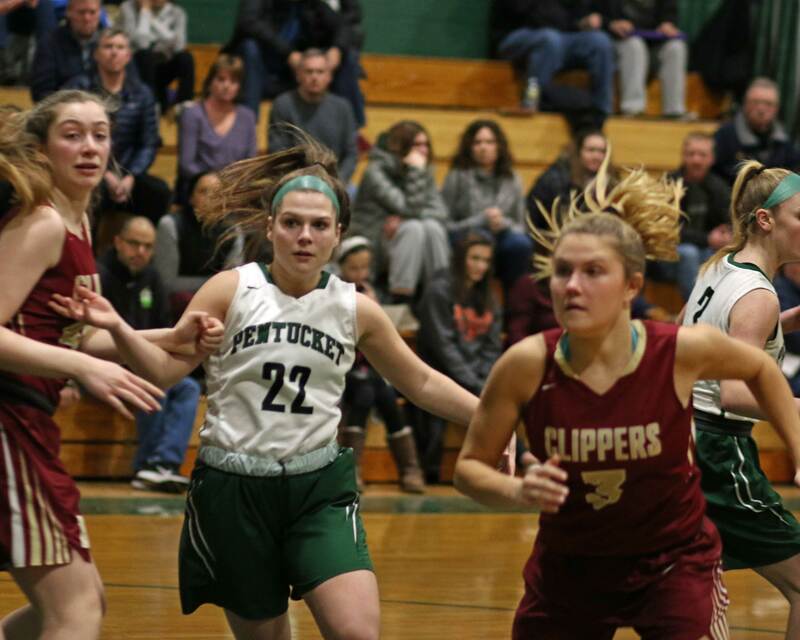 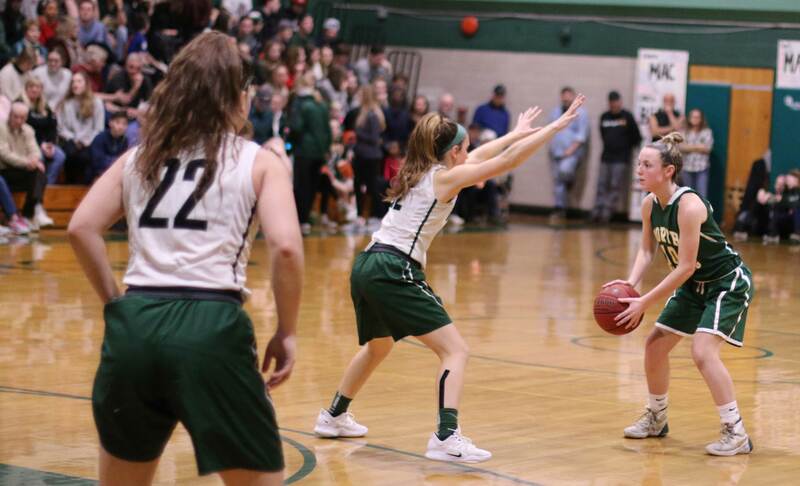 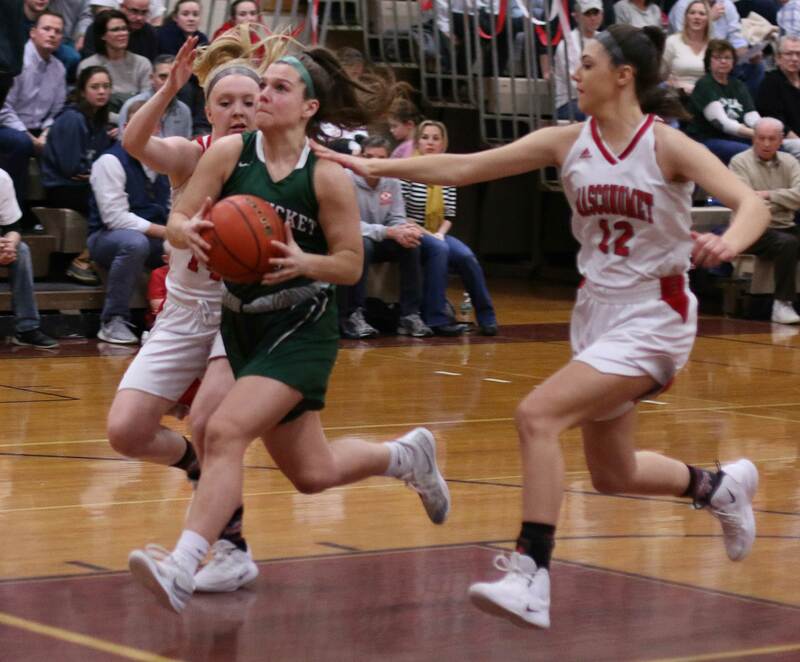 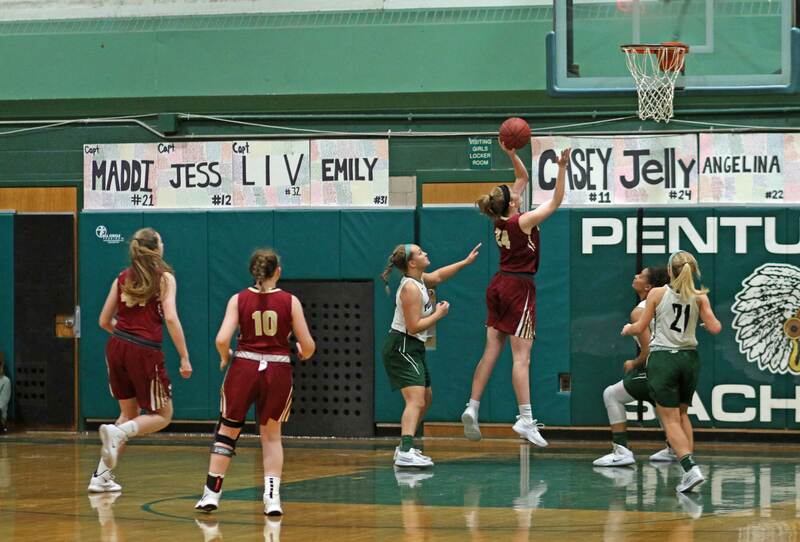 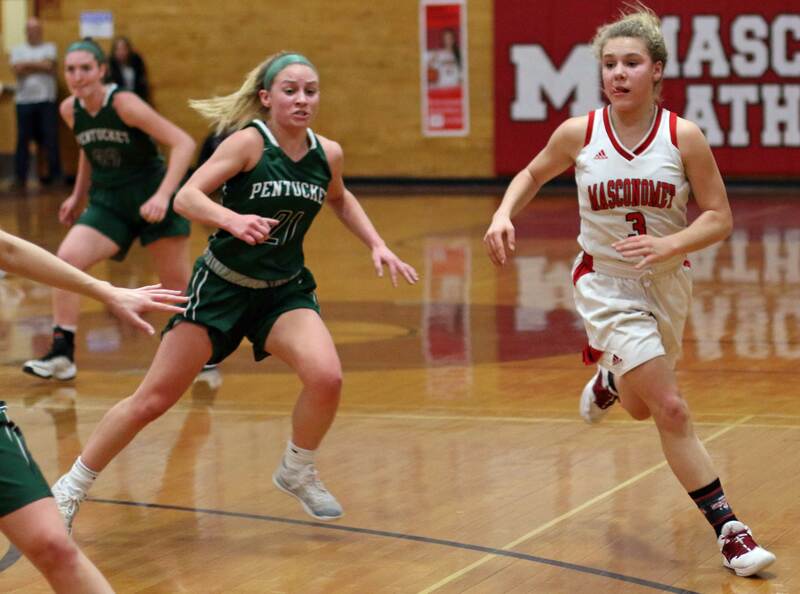 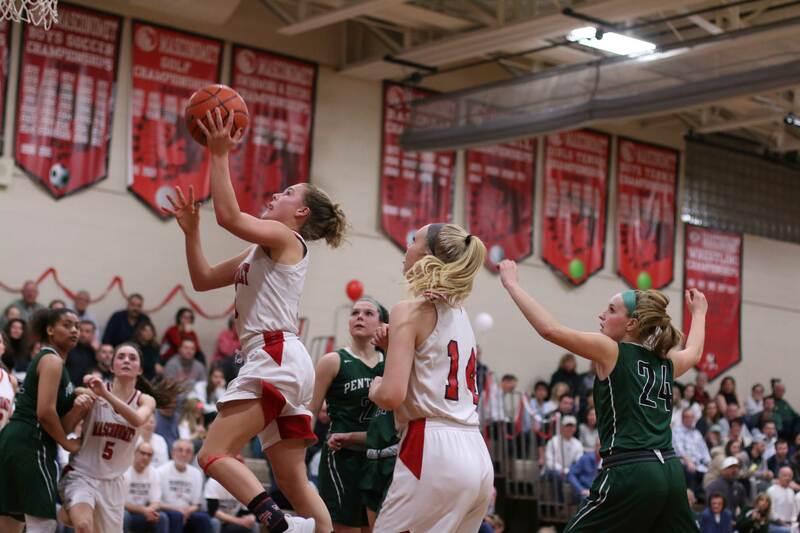 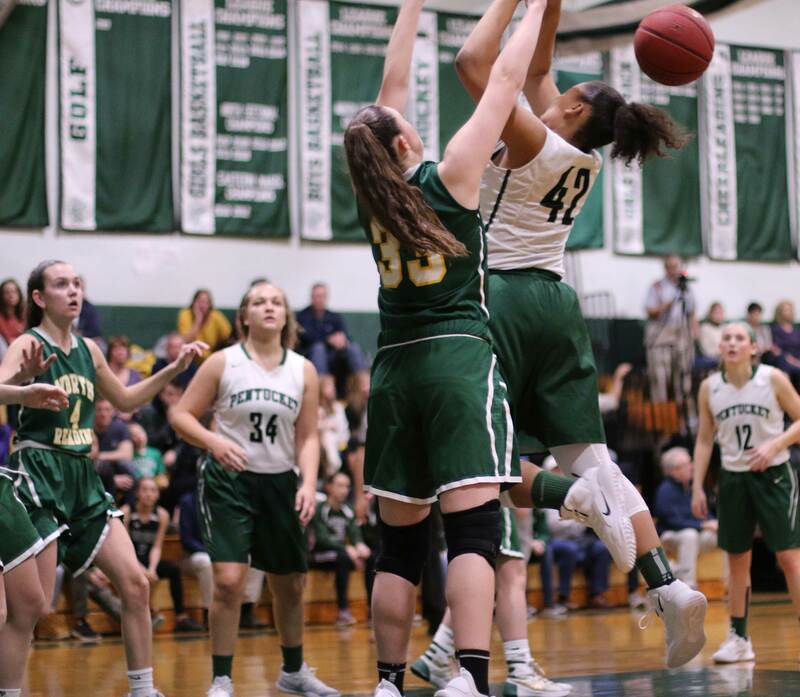 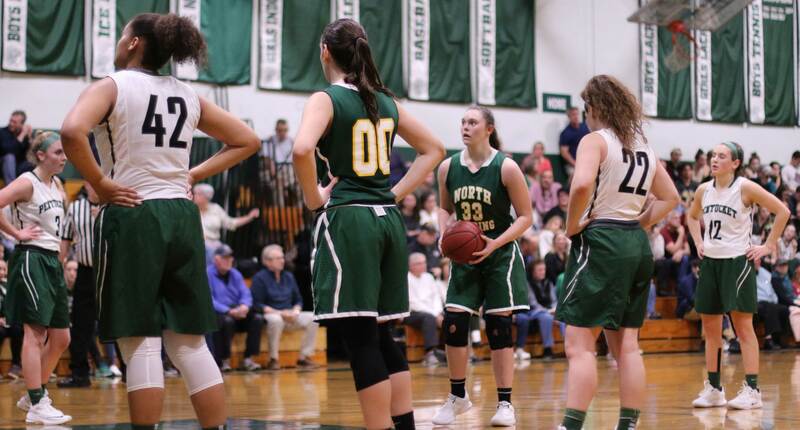 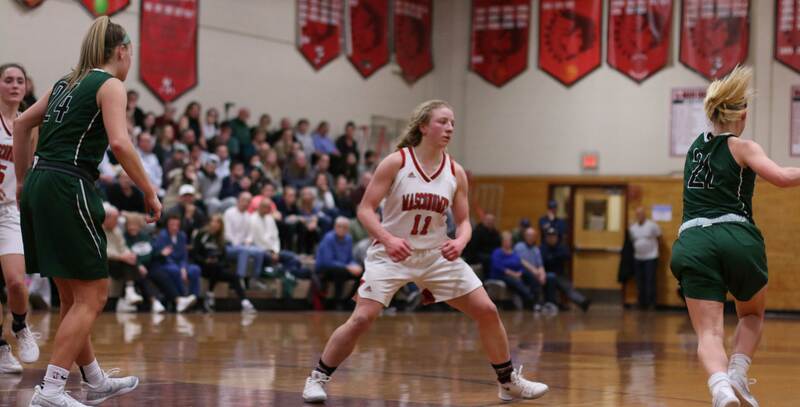 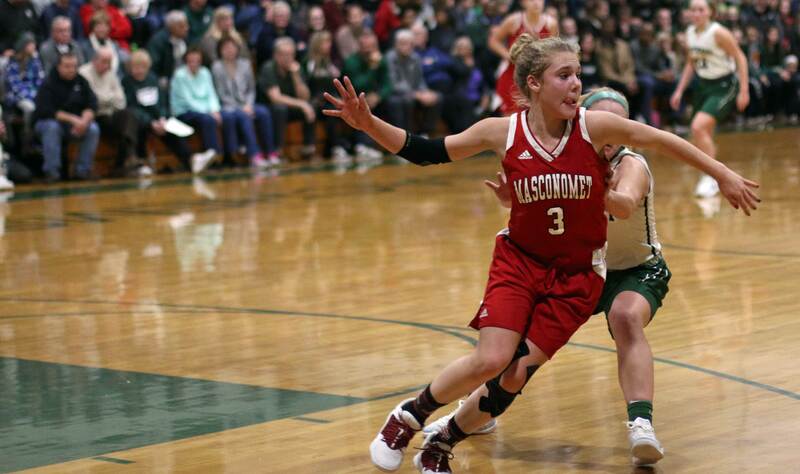 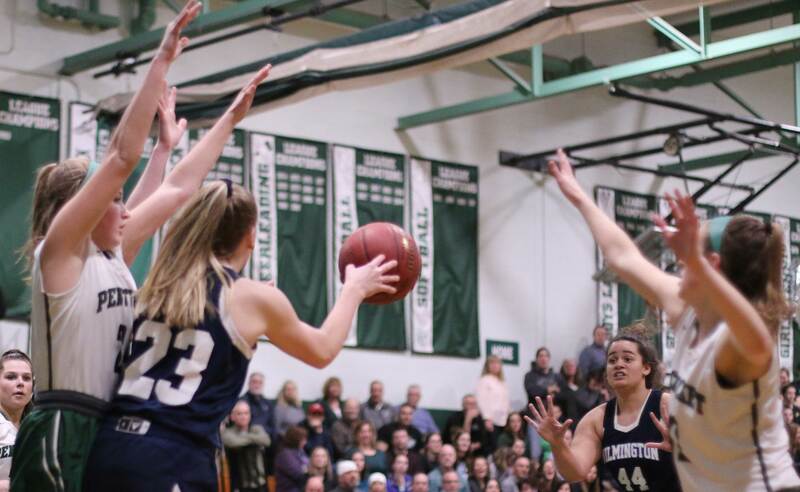 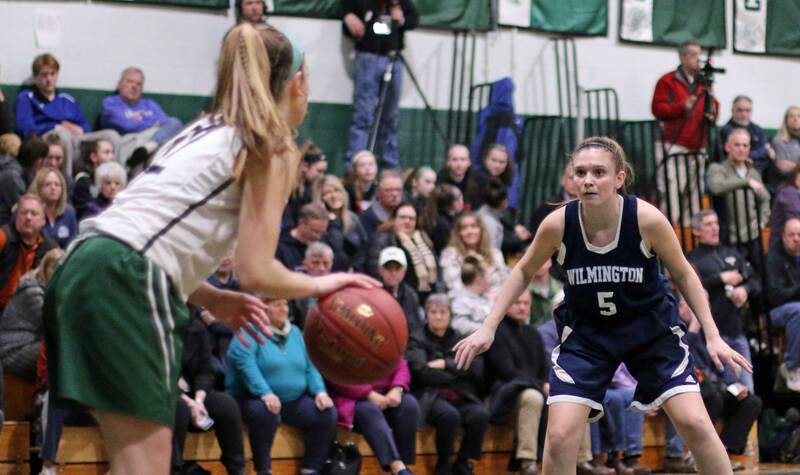 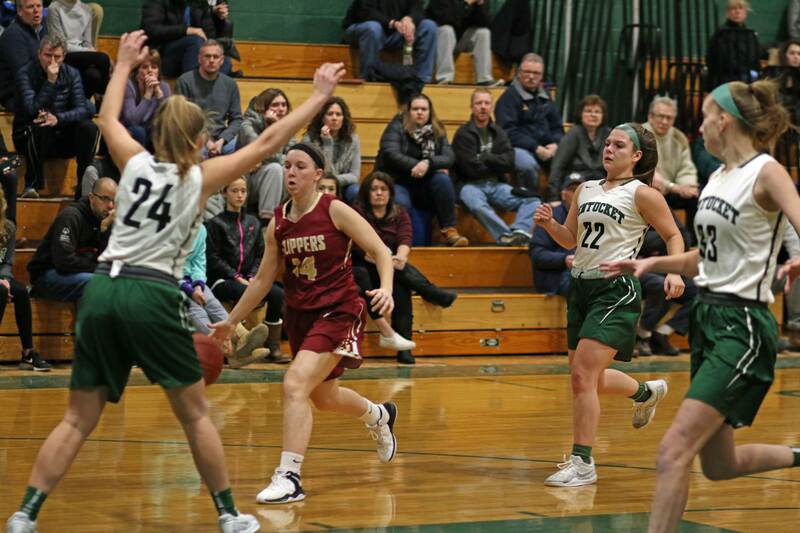 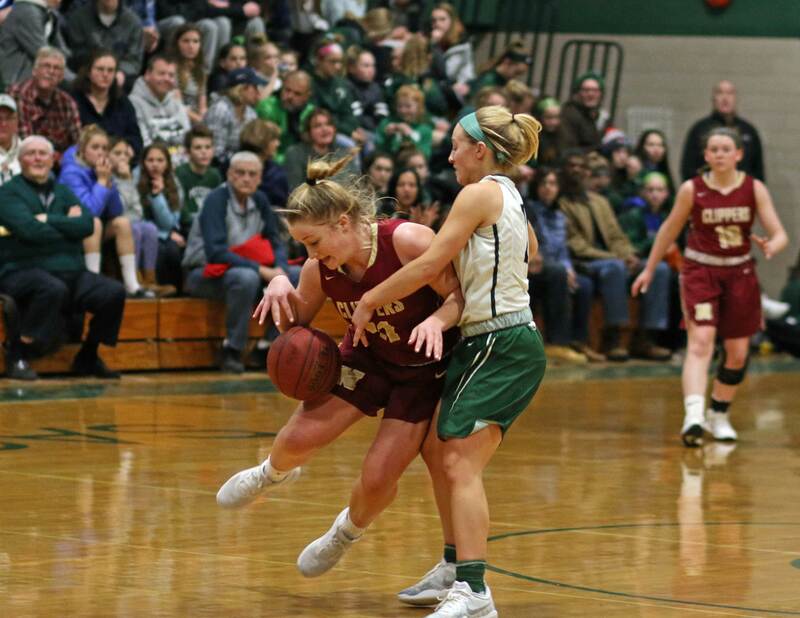 On this night, the Sachems turned up layups on inbounds plays, backdoor cuts, and a full-court pass (Angelica Hurley) that led to a layup (Angelina Yacubacci) against full-court pressure. 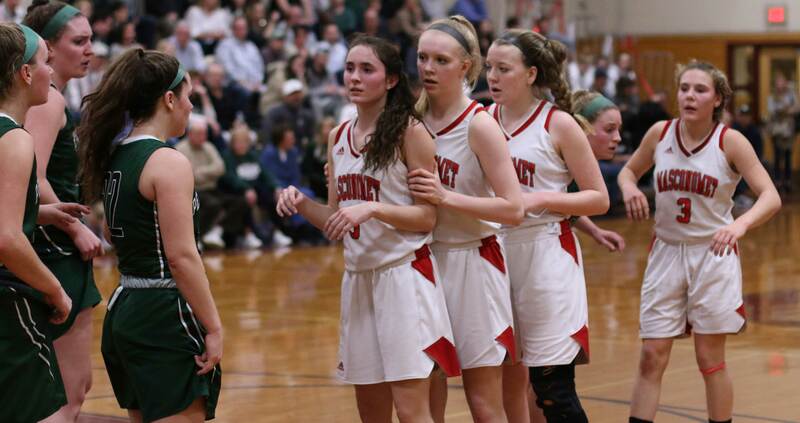 After the first quarter (13-2) the Sachems joined the Hornets in struggling to score. 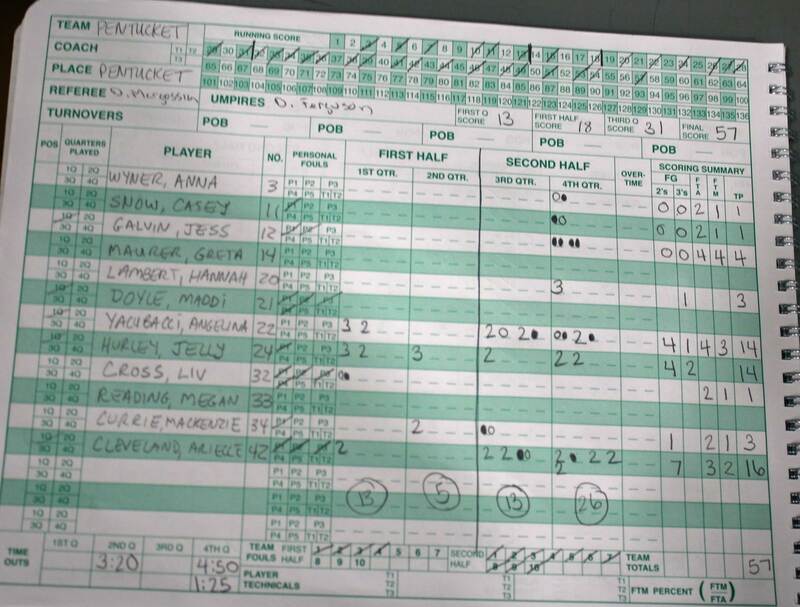 That lasted into the final quarter. 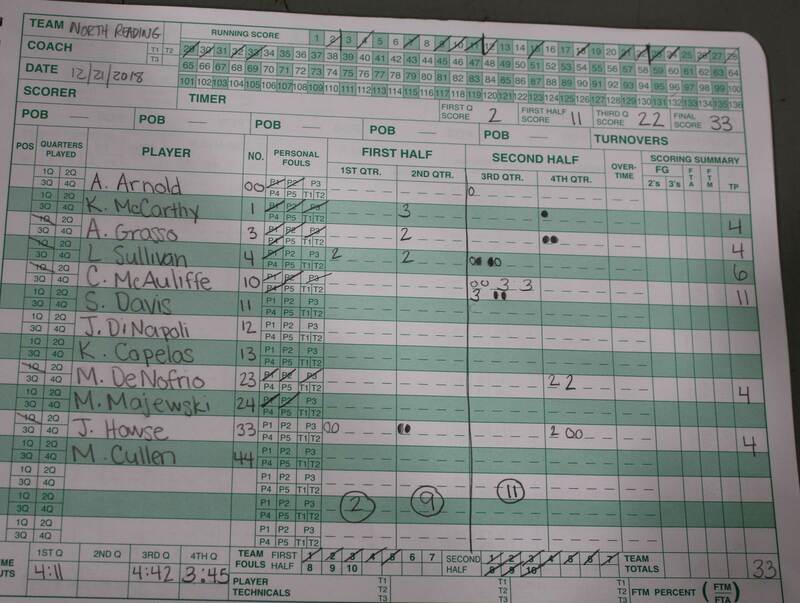 NR was within nine (31-22) as the 4th period began. 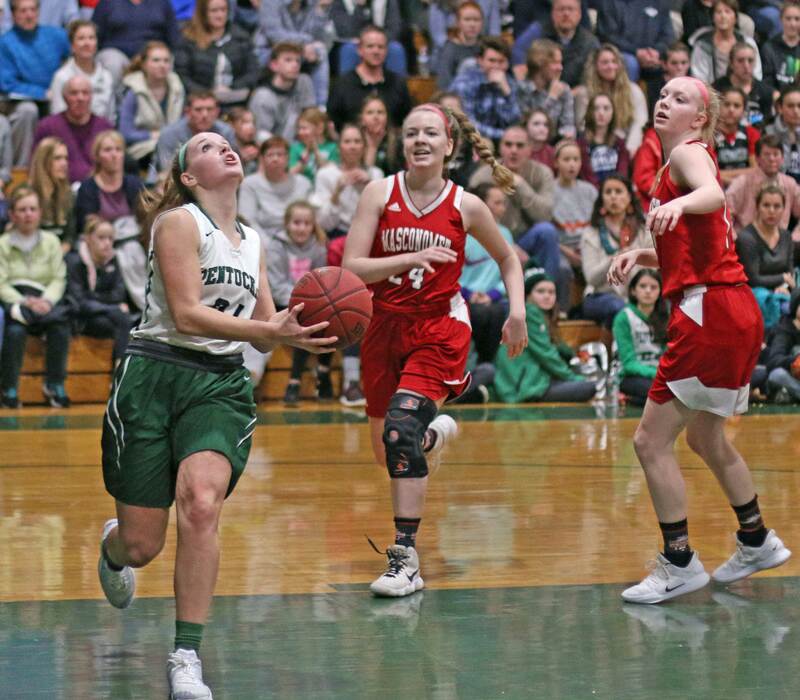 In that final quarter the Pentucket defense, which had been very good, was joined by a good-things barrage down the offensive end. 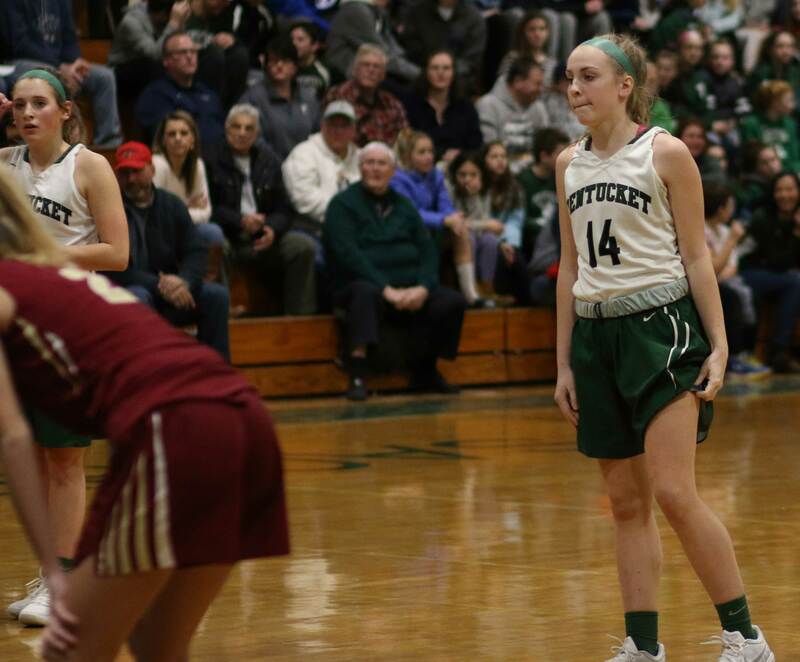 The points started flowing from in close (seven layups) and the lead reached twenty (50-30) 5 ½ minutes into the last quarter. 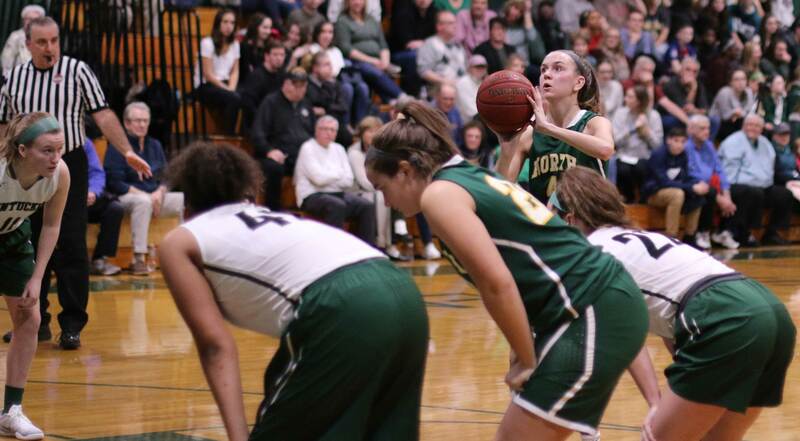 Lauren Sullivan paced the Hornets with eleven points. 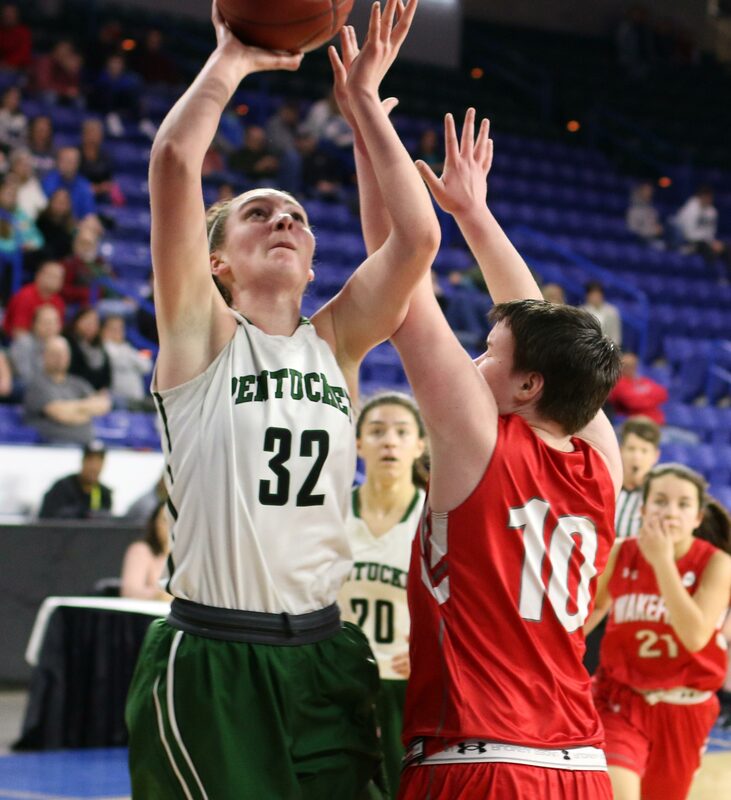 “North Reading is a very good team,” said Coach McNamara. 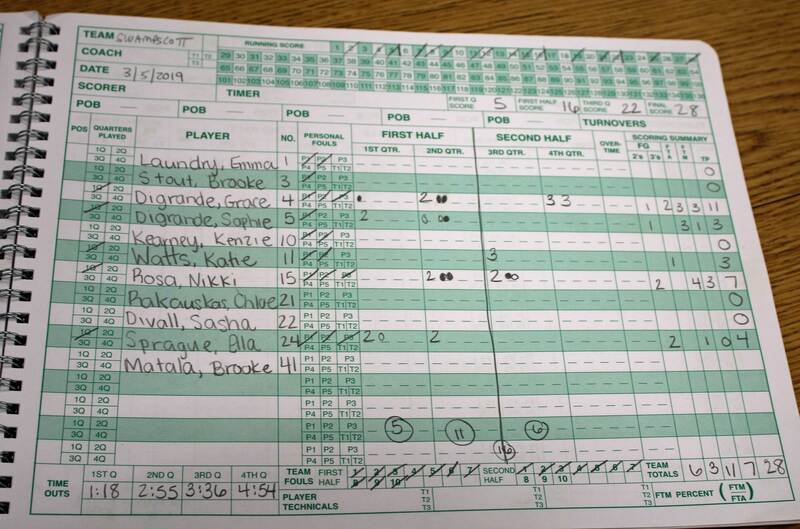 “I thought that they might be the best team in the CAL.” Not on this night. 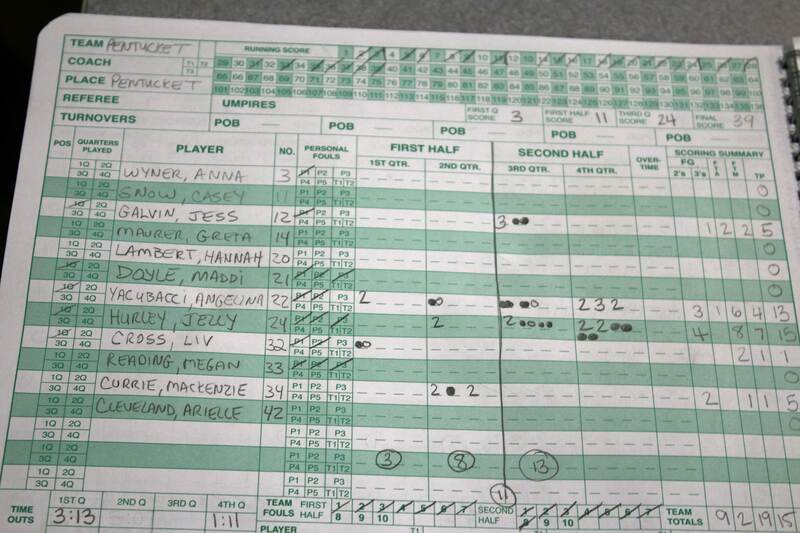 The Hornets never got comfortable against the hounding man-to-man coverage they faced. 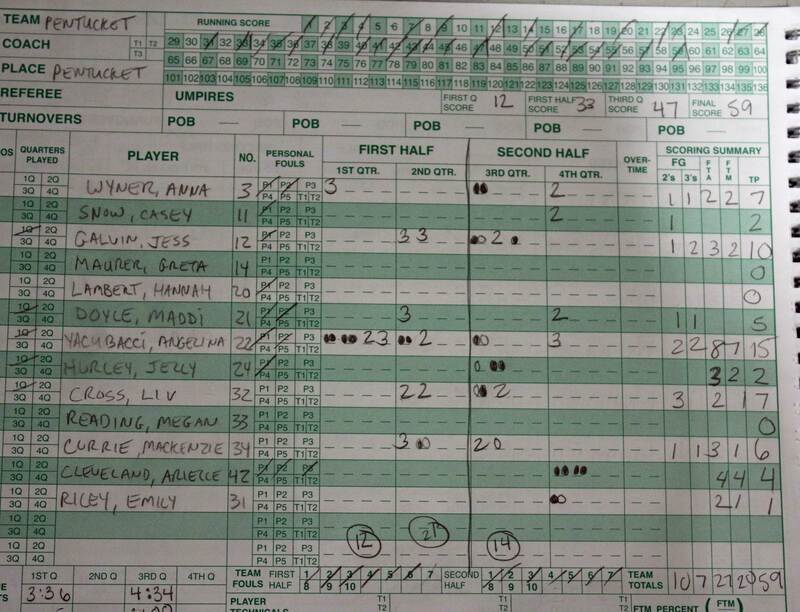 Much of their movement on offense was east-to-west rather than toward the basket. 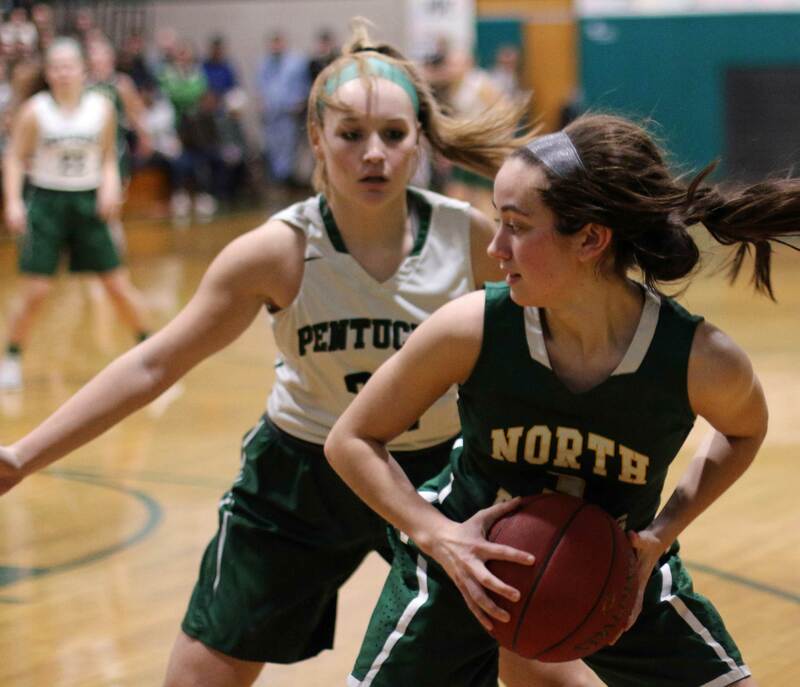 The North Reading defense was solid in the middle periods. 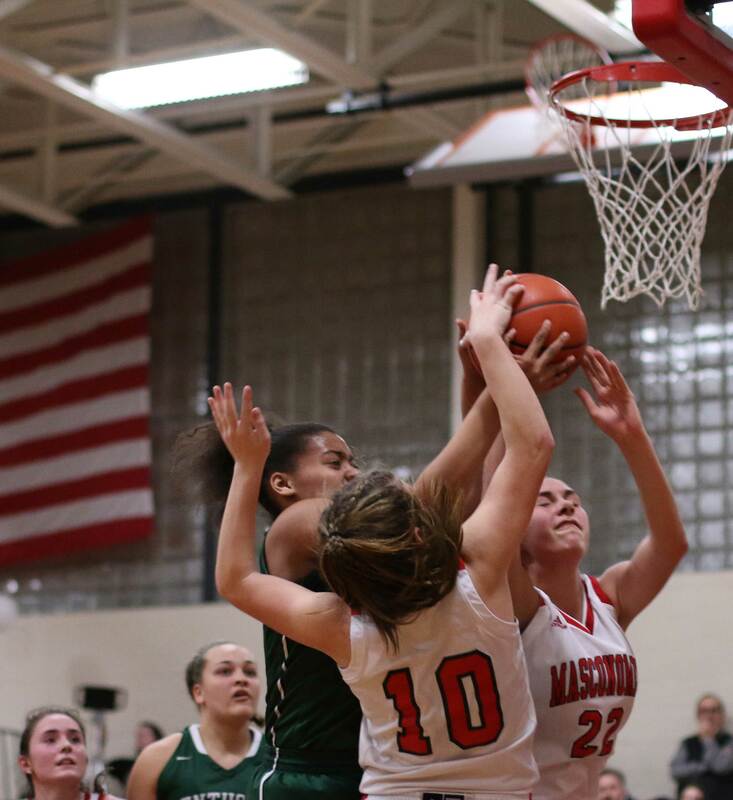 Sophomore Julia Howse had at least four blocks by my count. 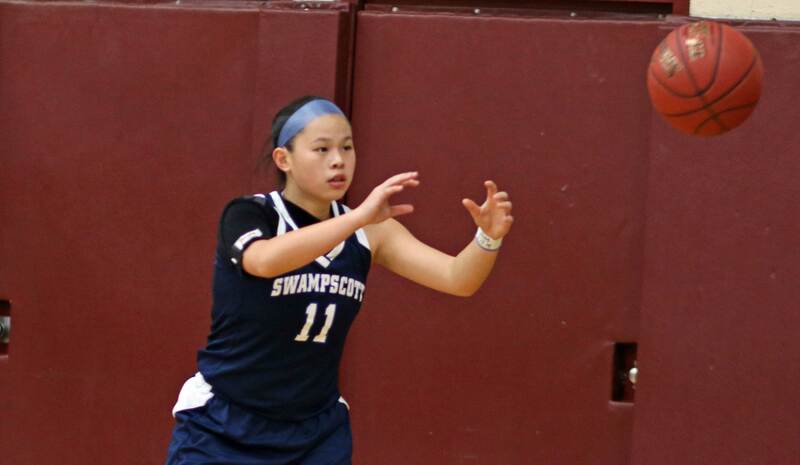 She also made several terrific cross-court passes. 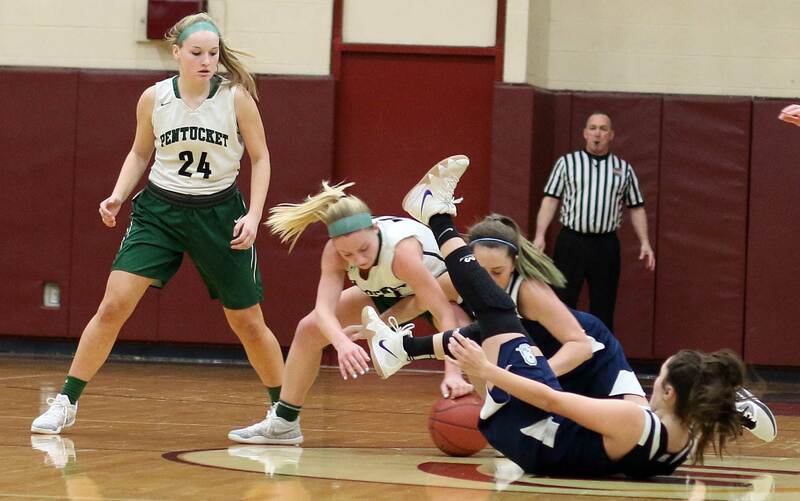 I won’t get into her skills as a shortstop on the NR softball team! 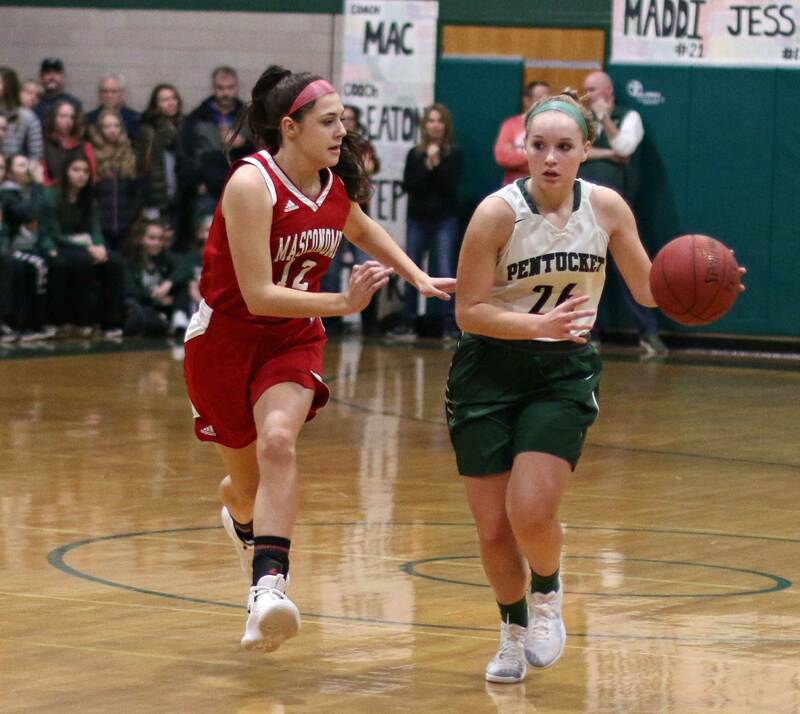 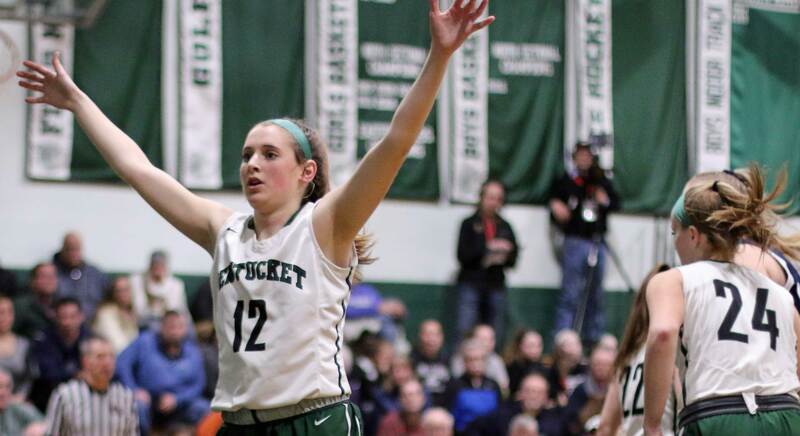 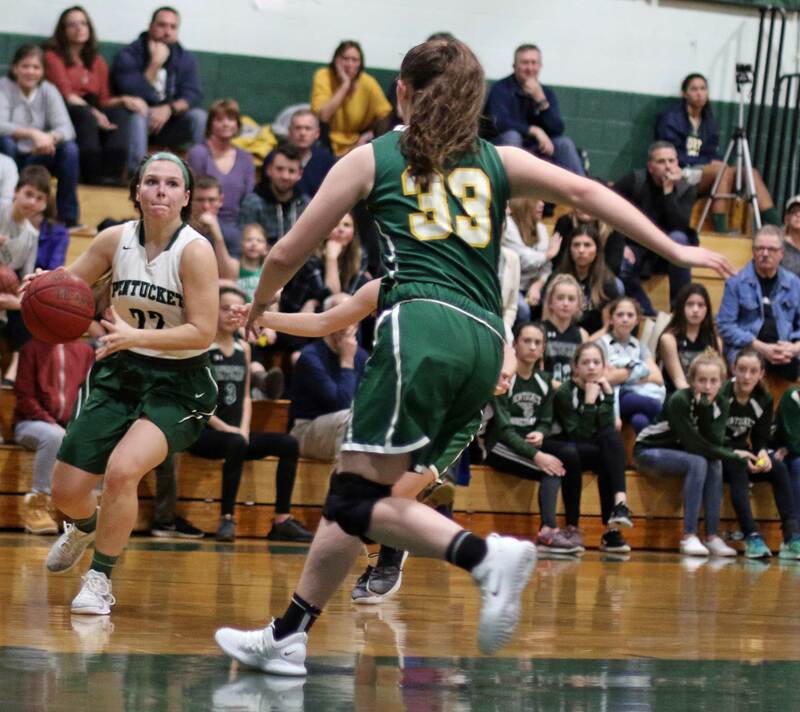 Angelina Hurley and Angelica Yacubacci each had fourteen points for Pentucket. 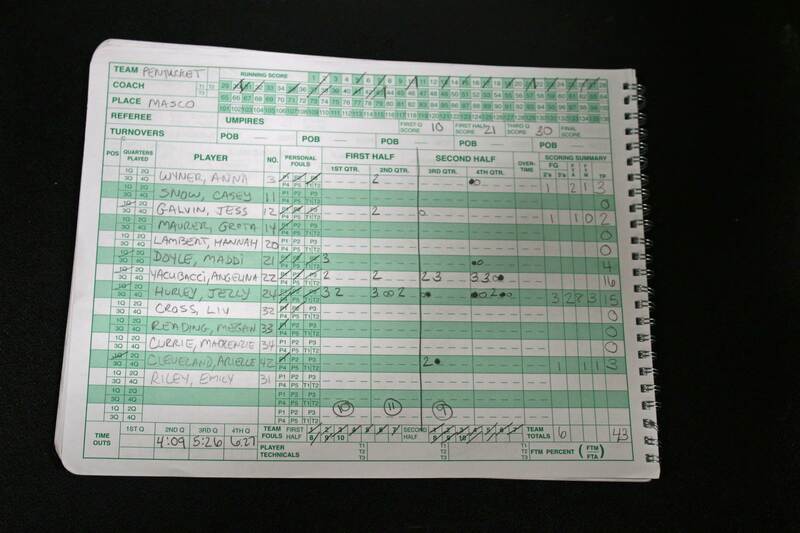 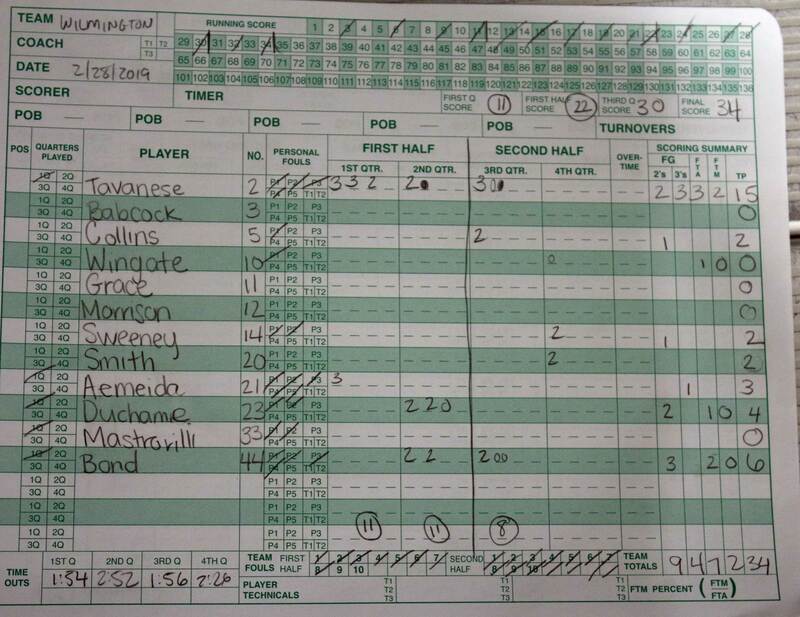 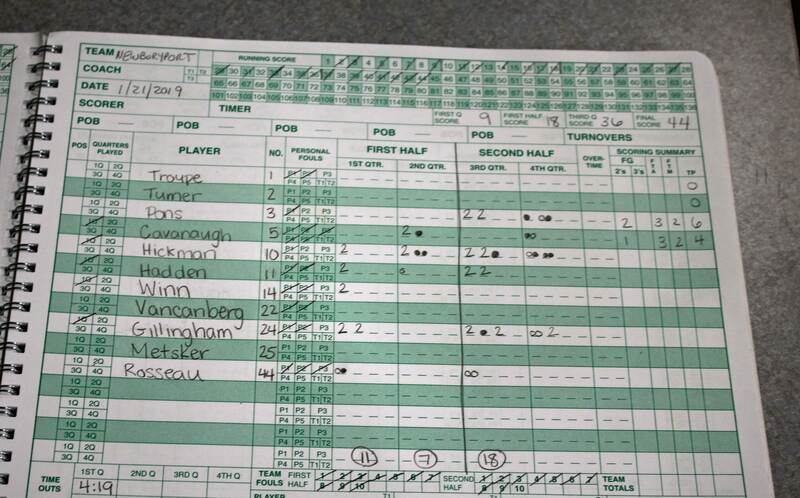 The Hornets were able to limit the Sachems to only three 3’s. 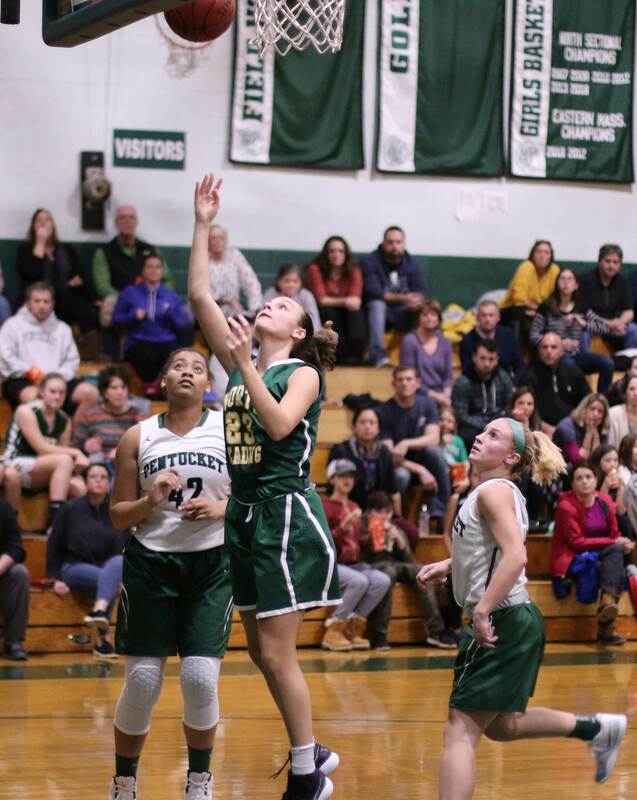 However, by closely defending the perimeter they opened up driving opportunities for Angelina, Angelica, and Jess Galvin. 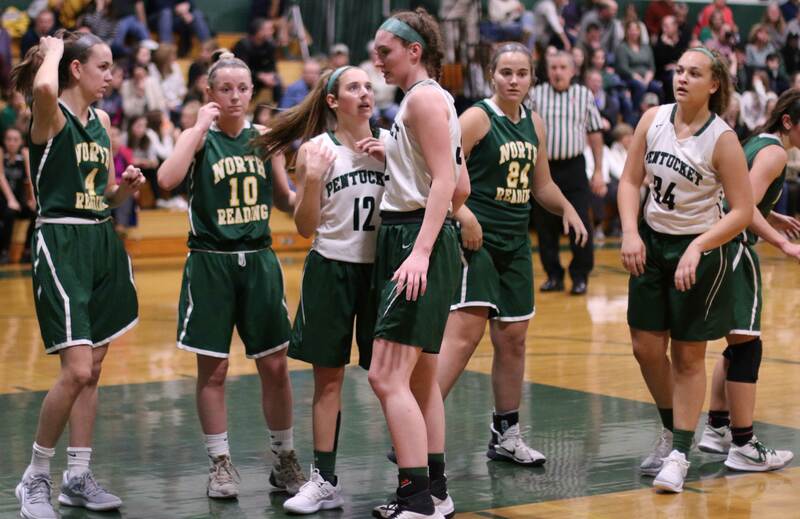 North Reading was 16-6 last season. 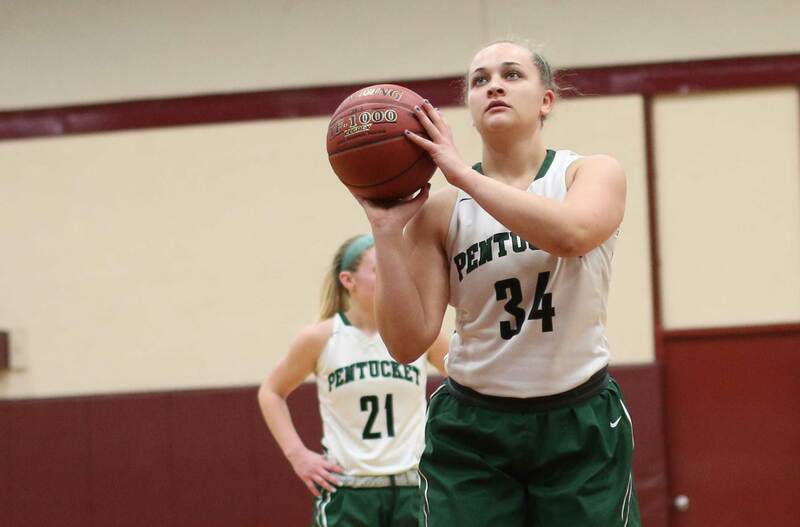 Pentucket was 23-3 last season. 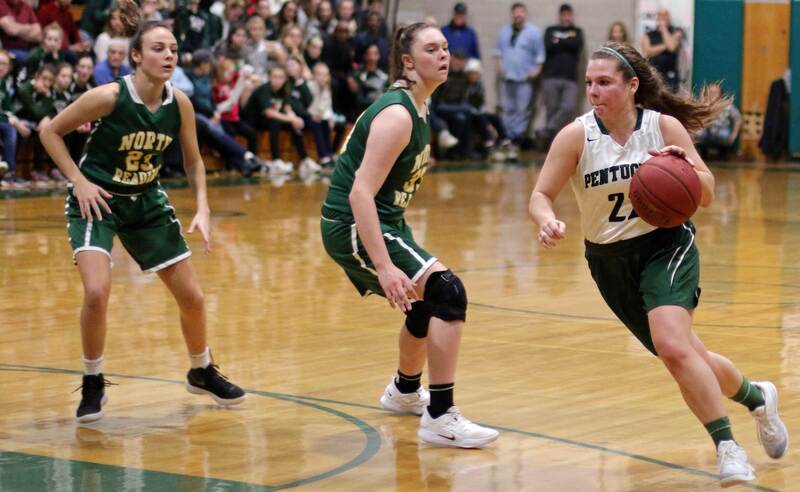 Coach McNamara is in his 13th season with Pentucket and currently has a remarkable 260-44 won/loss record during that time. 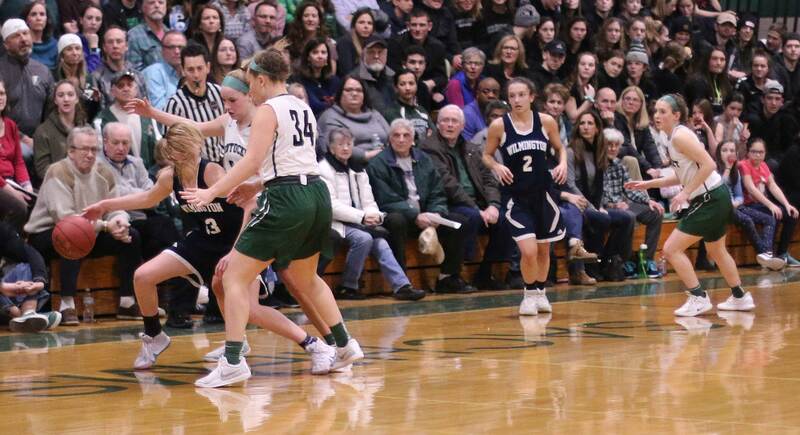 Good crowd in house on a warm (for December) night outside.